ON OCTOBER 19TH last, Masonic delegates from the Grand Lodge of New York, from Austria, Belgium, Bulgaria, Spain, France, Italy, Holland, Portugal, Turkey, Switzerland, and the Grand Lodge "To the Rising Sun" of Nuremburg, assembled at Geneva, Switzerland, and there, after six sessions, organized the Masonic International Association. Four other Grand Lodges, one of which was the Grand Lodge of Louisiana, wired regrets at not having delegates present. American Freemasonry was represented by three brethren from New York, Townsend Scudder, Wm. C. Prime and Arthur S. Tompkins. At our request Brother Scudder has sent us in brief the estimate which he has formed of the International Association. Brother Edouard Quartier la Tente, 33°, who has labored through so many years to bring about a cooperation of the Masonic Powers of all lands, has received a recognition and reward for all his self-sacrificing efforts by being made Grand Chancellor of the new Association — a very high honor. THE BUILDER extends to Brother Quartier la Tente its congratulations, and prays for him many years of fruitful and successful service in his new office. The Conference established an agency through which all Grand lodges are enabled to deal with one another in their efforts to get at the truth concerning each other, thus facilitating their getting the facts upon which to base their several judgments of each other, instead of having to rely and act largely upon hearsay, as has been the case in the past. Contact between jurisdictions is afforded without their being in diplomatic relations with one another, through their joint membership in the Association. Recognition and diplomatic relations will begin only when agreeable to those concerned. The membership of Grand Lodges belonging to the Association must be composed of men exclusiveIy. Thus Woman Masonry, as a part of the Order, is disposed of. Members of the Association respect the territorial integrity and jurisdiction of each other member. Foreign lodges within our territory, chartered by legitimate Grand Lodges, acting, however, in hostility to our claims of territorial jurisdiction, will be eliminated. Grand Lodges maintain each its sovereign independence. The Association has no concern with matters other than those of its own organization and functioning. New York is one of the organizers and founders of the Association, the first Masonic international body in Symbolic Masonry in the history of the Fraternity. It is one of the five Grand Jurisdictions entrusted with the management of the Bureau for the first three years of its life. It controls the question of membership in the Association so far as the United States is concerned and thereby is in a position to eliminate recognition of clandestine bodies which in Europe heretofore have often, through ignorance, been recognized, and thereby have been enabled by pointing to such recognition to give themselves the semblance of legitimacy and use it to further their fraudulent financial schemes. Membership in the Association is dependent upon subscribing to the principles enunciated. These, however, are not exclusive, but embrace those things upon which all can agree, leaving open for future accord and understanding matters not touched upon, they thereafter to be incorporated in the Declaration of Principles, as agreed from time to time. Grand Lodges, and not individuals, are given prominence in the management and direction of the Association. Hereby is minimized the opportunity of competition for individual aggrandizement. The Grand Master for the time being, or the Grand Lodge over which he presides, determines who shall express its will on the advisory committee, when such Grand Lodge is an elected member of that committee. This plan of government dwarfs the individual and exalts the institution; it lessens the likelihood of any one individual attempting to pose as the head of Freemasonry. The duration of his term in his representative capacity is beyond the control of the individual; it is entirely under the control of the Association and his Grand Lodge. These two would have to act in concert before any one man could gain ascendancy over the Association. The Masonic Grand Jurisdictions represented in Congress, with a view to making more effective their humanitarian and pacific mission, proclaim hereby constituted a Masonic International Association, the seat of which is Geneva. All Masonic Grand Jurisdictions which subscribe to the Principles, herein set forth, shall be eligible to membership. Inspired by the ideal shared by all, each Grand Jurisdiction in this Association retains its sovereignty, its traditions and its ritual. Freemasonry, founded on land marks philanthropic, philosophic and progressive, the basis of which is the acceptance of the principle that all men are brothers, has for its object the quest of Truth, the study and practice of morality, and of that which will lead to unity among men. It labors to better the condition of humanity from the material and spiritual standpoint as well as to lead it to a higher intellectual and social plane. It has for principles, toleration, respect for others and for self, liberty and conscience. It holds it to be its duty to extend to all members of the human family the bonds of fraternity, which unite Freemasons the world over. Freemasonry, deeming work to be one of the essential duties of man, honors equally those who toil with their hands and those given to intellectual pursuits. It is composed then of a society of upright men, free and faithful, who, bound together by the ties of liberty, equality and fraternity, labor individually and collectively to promote social progress, giving expression thereby to beneficence in its loftiest sense. Part I. Regulations and Statutes. To maintain and to develop existing relations between Masonic Grand Jurisdictions. Art. 2. — The Association and each Grand Jurisdiction forbids itself all interference in the domestic affairs of all other jurisdictions. Each Grand Jurisdiction is invited to exchange with associated Grand Jurisdictions its program of work and to promote opportunities of contact with a view to harmonizing and coordinating efforts held in common. Nevertheless the fact of membership in the Association does not imply an obligation to entertain direct relationship with other Grand Jurisdictions which are members. Art. 3. — All Grand Jurisdictions belonging to the Association must be composed of men exclusively. Part II. Admission, Resignation, Exclusion. Art. 5. — The candidacy of a Grand Jurisdiction for membership in the Association cannot be considered, excepting it be seconded by three Grand Jurisdictions which are members. Among the Grand Jurisdictions sponsoring a candidacy must be included those members of the Association having their seat in the same territory as the candidate. Provided however that the endorsement by the Grand Lodge of New York of the candidacy of Grand Lodges in the United States shall be required. When, however, more than three American Grand Lodges shall have given their adhesion to these articles, the Grand Lodges of the United States which are members of the Association are authorized to select from among the Grand Jurisdictions of the United States which shall have subscribed to these articles, the Grand Jurisdictions which shall act as sponsors for candidates. Art. 6. — Each candidacy shall be submitted immediately to all member jurisdictions by notice of the Secretariat. The candidate shall be declared elected by the Advisory Committee if there shall not have been registered an objection thereto stating the reason within six months from the day when the Secretariat shall have sent out the notice aforesaid. The final admission shall be proclaimed by the Congress. Art. 7. — Each jurisdiction may withdraw freely from the Association if it has met its financial obligations. The Secretary forthwith shall notify each member jurisdiction of such withdrawal. Art. 8. — Expulsion may be decreed by the Congress where a jurisdiction shall have violated the provisions of these articles or the spirit of the declaration of principles. Part III. The International Congress. Art. 9. — The International Congress is the ruling agency of the Masonic International Association. Its jurisdiction is limited to questions only affecting the Association. It shall meet every third year and shall fix the place and the date of its next reunion. Each member Grand Jurisdiction casts one vote. No delegate can act as proxy for more than two members. Art. 10. — To constitute a quorum the congress must bring together half plus one of its membership. The congress shall determine the vote required to adopt a measure excepting in the matter of elections to membership and of expulsions of members which must be voted by two-thirds of the jurisdictions represented. Art. 11. — In case of emergency and for serious matters the congress can be called in extraordinary session by the advisory committee on the demand addressed to the Secretariat by five Grand Jurisdictions. It will sheet in such a case at Geneva. Its order of business is limited to the matter which caused the reunion. Part IV. The Advisory Committee. Art. 12. — The advisory committee is named by the congress. It is composed of five Grand Masters or their representatives. Has in charge the execution of the resolutions of the congress. It takes the steps necessary to realize within the provisions of the regulations, the purposes of the Association. It audits the accounts of the Secretariat and submits them to member jurisdictions. It has power, in case of necessity, to authorize expenditures not provided for in the budget. Part V. The Secretariat (Bureau). Art. 14. — The Secretariat is subject to the authority of the congress and the advisory committee. Art. 15. — The Secretary is elected by the Congress He is charged with the execution of the decisions of the congress and of the advisory committee. The Secretariat shall publish a quarterly and an annual bulletin. The Secretary is the Treasurer of the Association. He receives the dues of members and meets the expenses provided for in the budget. He shall incur no expense not provided for in the budget without the approval of the advisory committee to which he shall present annually an account of all receipts and disbursements and a tentative budget. Art. 16. — The Secretary shall receive the honorariums, the amount of which is determined by the congress. The management of the office staff is under his jurisdiction. The regular staff shall be members of a legitimate Masonic body. The rent, lighting and upkeep of the offices of the bureau shall be at the expense of the Association. Art. 17. — In case of the resignation or the death of the Secretary, the vacancy shall be filled temporarily by the advisory committee. The dues of members based on a sliding scale fixed by each congress: the maximum to be $1,000 the minimum to be $20. Subscriptions to the Bulletins and the sale of Masonic works. Art. 19. — All amendments to these statutes must be proposed six months in advance and adopted by the affirmative vote of a majority of two-thirds of the Grand Jurisdictions represented. The dollar is taken at its commercial value before the war. Budget (in Swiss Francs) for 1922. And simple pleasures that always please. And share in his joy with a friendly glow. All men as brothers, is better than gold. UNTIL comparatively recent times no historical work on Freemasonry was considered complete without an account of the "Travelling Masons." We have been gravely assured by the writers on the subject, that Freemasonry in medieval times was an international association of church builders, incorporated under a charter issued by the pope, granting to the society a complete monopoly in the building of religious edifices. It was said that the mysteries of Gothic architecture, both operative and speculative (practical and theoretical), were the particular secrets of the corporation; and whenever a new cathedral or other religious house was contemplated requisitions for plans and specifications must be made to the headquarters of the body. When the plans were prepared and approved, orders for details of craftsmen were sent from headquarters to the subordinate lodges throughout Christendom; and from north and south, east and west, masons obeyed the summons and journeyed to the site of the proposed building, under the leadership of their overseers or wardens. On arrival at their destination, they made themselves known to the master builder by means of secret signs and tokens. Huts, or lodges, were then built, in which the workmen prepared the material for the structure in accordance with plans and specifications. In these lodges the craftsmen held their meetings, and here the mysteries of the craft were imparted to such profanes as had been found "worthy and well qualified." It was claimed, further, that under the terms of the charter, the fraternity was empowered to determine the wages and hours of labour of its members, as well as other conditions of employment. The craftsmen were not subject to the law of the land; but all charges or accusations against a member, whether made by a fellow or by a profane, were tried before the tribunal of the society which was clothed with complete judicial powers. But alas, the belief in the existence of an international corporation of builders has been shattered and swept into the dust by Robert F. Gould, together with many other venerable cobwebs which had gathered around the columns and arches of the Masonic edifice, thus preventing us from viewing the structure in the light of true history. Gould demonstrates conclusively that "International Freemasonry" in the Middle Ages is a fiction. Careful search in the archives of the Vatican has failed to bring to light the slightest evidence that the Masonic Craft has ever received any special horrors or favours from the pope; and the only basis for the belief in papal patronage seems to be that at various times popes and prelates issued bulls promising indulgences to persons who should make liberal donations of money, lands or labour, to churches in course of construction. Nor has anyone been successful in locating the headquarters of this "international society." True, the German Steinmetzen (Freemasons) were organized along more than local lines. In 1567 they formed a federation of craft societies in German lands and elected the workmaster of Strassburg cathedral their chief judge (Oberste Rychter); but the federation did not extend beyond the boundaries of Germany, and the authority of the central government did not at any time receive more than passing recognition. As a matter of fact, the real bond of union between the constituent bodies lay in their common objects and common craft usages. Gould has further shown that the general features of the Freemason's craft societies did not differ from those of other callings, and such differences as did exist were due to local conditions and the peculiarities of the trade. In the first place, the Freemasons' guilds were of later origin than those of other crafts. The former did not come into existence until architecture and building operations generally had become so refined as to necessitate specialization and subdivision of labour. Originally all masons, whether they worked in rough or squared stone (ashlar) or brick, as well as tilers, slaters and those working in the other component divisions of the building industry, were members of the same guild. As time passed the lines of demarcation between the different branches of the industry became more clearly defined with a consequent division of the organization. Finally, when the art of Gothic building had so far advanced that it became necessary to specially, train men as architects and to design and execute the delicate stonework and sculpture, a future division took place. The architects, designers and sculptors branched off from the mother society and organized separately. Their work was of the highest character, and became more art than a craft, requiring technical and science knowledge as well as great manual skill. Their profession stood at the head of the building trades, and became known as Freemasonry. Only a limited number of fellows were required; and in consequence we find masters, journeymen (fellow crafts) and apprentices members of the same guild; while in other trades, such as the masons' and carpenters' employing larger bodies of men, the journeymen at an early period withdrew from the masters and formed fraternities of their own. The apprentices, while they were members of the craft, were not eligible to membership in the guild. There were still other points of difference: The Freemasons were employed almost exclusively upon religious buildings. This brought their craft in close contact with the clergy, and from this association the Freemasons' societies received a deep religious imprint that is not apparent in those of other crafts. The profession of Freemasonry was held in high esteem in the Middle Ages. The Church was rich and powerful and displayed its wealth and taste in the construction of beautiful churches. In fact, church architecture was the only outlet for the genius of the people; all the intellectual forces of society seemed to converge in architecture and kindred professions; and the calling, therefore, attracted the best minds and the highest intellects of the times. All other knowledge was discouraged and condemned by the Church. Victor Hugo says that down to the time of the invention of printing the progress of humanity in art and science is recorded in a "book of stone" — Architecture! Gothic architecture commenced to decline after the Reformation. The power of the Church was broken; its right to levy contributions upon the people was taken from it; and the people found other means of satisfying their desire for knowledge, and to gratify their artistic tastes. Freemasonry as an operative art declined with the discontinuance of Gothic church building, and with it went the operative fraternities. In order to perpetuate the institution, the lodges admitted to membership men who had not been bred to the trade. In many cases these "accepted" brethren were men of learning and science, and through their influence the lodges were gradually transformed into "speculative", or philosophical societies, in which form they have come down to our times. As time passed, the old customs of the operative days fell into disuse and became only memories and traditions; and, later, more or less fantastic explanations of their meaning and purpose were invented, such as the legend of the "Travelling Masons." In order to get a clear view of the craft usages of our operative Masonic forefathers, we must look for their parallels in kindred crafts, such as the masons and carpenters, whose fraternities have had a continuous existence from the Middle Ages down to our own day. Gould, in his chapter on the German Steinmetzen (Freemasons), borrows freely from the carpenters and masons for illustration of Masonic customs. He conveys the impression that these societies, like their Freemasonic relatives, have become extinct. In reality they still exist, although now rapidly falling into decay, due to several reasons: the encroachment of modern trades-unionism; the fact that the state has assumed some of their benevolent and charitable functions; and, finally, because the stringent apprenticeship rules are being more and more relaxed. It is an immemorial custom in these crafts, when an apprentice has completed his service, to spend three years in travel from place to place, working for a time in each. The purpose of his journey is to familiarize himself with the methods employed in various places; to enable him to "see the world," and, finally, to prevent crowding the trade. In this pilgrimage the journeyman travels under the auspices and protection of his craft guild, or fraternity. Following are a few facts concerning these organizations with particular reference to the carpenter's trade, a body which claims to be the senior of the building trades guilds, and to have had a continuous existence from the early centuries of the Middle Ages. The name of the society is "Die Fremde Zimmergessellen." The translation of the name presents some difficulties. "Fremde" in German means either a foreigner or a stranger, or one absent from home. Considering the connection in which the word is here used, "travelling" is the nearest equivalent in English. The name therefore signifies the "Travelling Journeymen Carpenters." The name reminds us of that used by the journeymen's societies of France (Sons of Solomon) whose members called themselves "compagnons étrangers" (stranger companions). The headquarters of the German carpenters' fraternity is at Bremen, and its subordinate lodges are dispersed throughout Central Europe. A new lodge may be formed in any place upon the petition of not less than seven members; but only one lodge may be chartered in any one city or town. In the vernacular of the craft, the opening of a new lodge is described as "Opening the Book," so called from the "Brotherbook," a manuscript volume containing the statutes and regulations of the fraternity, without which no lodge can be legally held. The copy of the Brotherbook, therefore serves the purpose of a charter. Lodges are sometimes opened in remote foreign countries; for instance, in Jerusalem, 1900; in Paris, 1904, and at Liege, Belgium, 1914. The executive head of the fraternity is called Hauptaltgeselle (Chief Senior Fellow), and the General Secretary-Treasurer is called Hauptbuchgeselle. Local lodges are presided over by the Senior Fellow (Altgeselle); the Secretary is called Buchgeselle. These officers are elected for six months. In addition the local bodies have an appointive officer, who performs the joint duties of Steward and Doorkeeper. When the apprentice has been set free by his master, after three years' service, he applies for admission into the journeymen's fraternity. His application is presented by a member who has worked with him and who vouches for his character and qualifications. The application must be accompanied by a certificate from the master under whom the applicant has learned his trade. In certain states the law prohibits the apprentice from taking employment as a journeyman until he has made an essay, or masterpiece. In such case proof of masterpiece must be furnished. If no objection is made, the application is approved, and the candidate is notified to present himself for initiation at the next meeting of the lodge. Should objection be made, the application is rejected without a ballot. After the lodge has been formerly opened the candidate is taken in charge by the member who presented his application, and who now acts as his sponsor. He is conducted to the Senior Fellow's station in the lodge. A number of questions are put to him by the Senior Fellow, and are answered for him by his sponsor. This dialogue refers to the importance and dignity of the craft, the objects of the fraternity, and in particular to the duty of the individual fellow to his brethren and to the craft. The candidate is asked whether he is willing to subscribe to these sentiments, and on his reply in the affirmative the obligation is administered, to the observance of which he pledges his word as a true man. He is then presented with "die Ehrbarkeit" (literally: Virtue), a black neckerchief, and is informed that this piece of attire is a symbol of manly virtue and the particular badge of the fraternity. He is instructed to wear it during all his waking hours, whether work or at play, and solemnly admonished never to disgrace it by word or act. In former times the fellows wore a distinctive livery, consisting of a short black velvet jack double rows of silver buttons, knee breeches of the same material, and black hat and shoes, together with the indispensable neckcloth. The livery has long since fallen into disuse, although the wearing of the "Ehrbarkeit" continues. It is still considered improper to wear shoes of any colour other than black, and the members have a special aversion to white hats. Then follows a lecture by the Senior Fellow in which the candidate is instructed in the rules and regulations of the fraternity, its customs and usages; how to conduct himself while travelling; how to present himself and make himself known to his brethren in foreign parts, etc. At stated times the Brotherbook is also read in the lodge. There is no mention of any grip or token; only a brief catechism to which we shall hereafter refer. The candidate is now a Junior Fellow (Junggeselle), and the ceremonies are concluded by draping his "ribbon" across the bar under the coat of arms of the craft, suspended over the Senior Fellow's station. This ribbon is of silk, about; six feet long by two inches wide, of any colour to suit the taste of the candidate; on one end is inscribed his name and the place and date of his birth; on the other, the date of his admission into the fraternity. The Senior Fellow orders the Steward to fill the "Harmony Tankard" (Vertragskanne), a large drinking vessel, which forms an indispensable part of the furniture of the lodge. The tankard is brought to the Senior Fellow, who dips his gavel in the beer and sprinkles a few drops of the liquid on the new-made brother's ribbon, and expresses the hope that the later will always live in amity and harmony with his brethren. The business of the lodge being concluded, the Senior Fellow calls off, and the health of the new brother is drunk, while the members join in singing their craft songs, of which they have many. I may mention here the peculiar form of salutation. A member is never addressed in lodge as brother or comrade; but always as "Ehrbarer Gesellschaft" (trusty fellowship). The form of address of the Senior Fellow is "Ehrbarer Altgeselle." The members remain standing "in order" during the entire meeting, heels together, toes pointing out, coat tightly buttoned and the hat held in the right hand over the left breast. This attitude is characteristic of the fraternity and is assumed on all occasions of craft business and ceremony. The Senior Fellow also presides standing, but with covered head. When the Junior Fellow is ready to travel, he applies to the lodge for clearance; but before it is granted must satisfy the Senior Fellow that he has parted with his master in friendship, that he is in fellowship with his brethren, and last but not least, that he is clear of debt. These matters being satisfactorily settled, he is given a clearance card, or "brief," as it is called, signed by the Senior Fellow and Secretary. The Senior Fellow again reminds the journeyman about to set out, that under the laws of the fraternity he is obliged to travel for three years; that at least once a year he must visit a city where a lodge is located, and work there not less than six weeks; that he should not remain in the same place longer than six months, and in no event more than one year; that he must not return to his birthplace, or the place where he learned his trade, during his wandering years, except to attend the funeral of a near relative, and in such case he should only remain over night. He is warned against keeping bad company and against incurring any debt, and urged to conduct himself in such a manner as to reflect credit upon the fraternity. The "traveler's" health is then drunk by his brethren with the wish for a pleasant journey and safe return. The lodge meetings are invariably held on Saturday night, and on the following day he sets out on his travels. In former times the brethren of the lodge accompanied him beyond the city gates with music and song, but this custom is now obsolete. He invariably journeys on foot, although there is no special inhibition against the use of speedier means of transportation. Senior Fellow: Who are you? 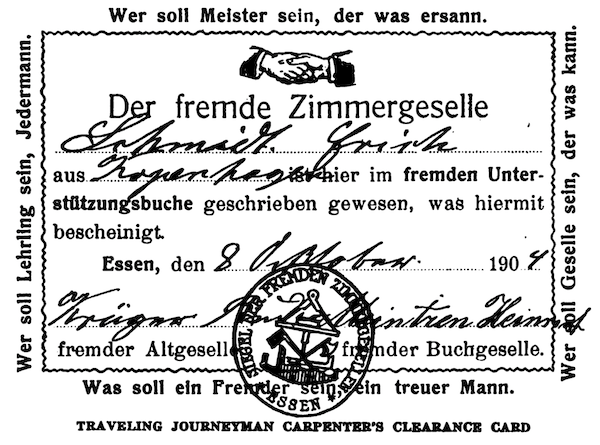 Fellow: A true and trusty (ehrbarer und rechtschaffer) Travelling Journeyman Carpenter, from . . .
Senior Fellow: What do you desire? Fellow: Under favour and by your leave, (mit Gunst und Erlaubnitz), to ask the trusty (ehrbarer) Senior Fellow to furnish me employment for eight or fourteen days or as long as it may suit the master, and according to craft custom and usage. Senior Fellow: 'Tis well! (das ist loeblich! Literally: Praiseworthy; an obsolete expression). The fellow lays aside his hat, unbuttons his coat and takes his seat. His name is entered upon the visitors' register, and he is told where he may apply for employment. He is then treated to a schnapps and a glass of beer. This ceremony is called "ausschenken"; literally, "drinking him out." He is next informed of the conditions of trade, wages, etc., and in turn he delivers the news of his travels. After this he is introduced to the landlord and landlady of the inn, whom thereafter he calls father and mother. If there is a daughter in the house, he calls her sister. His supper, night's lodging and breakfast are paid for by the lodge. If no one is present in the lodge room when he calls, he goes into the tap room of the inn, orders a stein of beer, and waits for some member to appear. When he recognizes an arrival by the black neckerchief, he strikes the table with his stein. The signal is immediately answered by the newcomer, who addresses his as comrade and inquires whether he can be of service. On the following Saturday he visits the lodge, but is not admitted until the meeting has been formally opened and the Senior Fellow has announced his arrival. He is then introduced to the brethren; thereafter he is recognized as a member of the lodge and entitled to take part in its proceedings. If no work is procured for him, and he is without funds, the lodge gives security for his board and lodging; but if he owes any debt, he is not granted clearance when he leaves town. Instead, he receives a letter addressed to the Senior Fellow of any lodge to which he may apply, informing him (the Senior Fellow) of the circumstance; and it is the duty of that official to arrange that a reasonable amount be remitted each pay day, until the debt is paid. Should he arrive at a town in which there is no lodge, he looks up some master who has been a member of the journeymen's fraternity and applies in the prescribed form. The master is authorized to tender such aid as the circumstances require, being reimbursed by the fraternity. If he should become involved in a quarrel or fight with a fellow member, or be accused of violating the laws or ethics of the craft, he is summoned to appear at lodge. He is examined by the Senior Fellow, who possesses power to hear and determine all questions of craft law and usage, and summarily to impose penalties upon the guilty brother. Even in grave cases the brethren are not asked to determine the guilt or innocence, or to assess punishment. The power of the Senior Fellow to try and punish is called domestic court (Stubenricht). The defendant has, however, the right of appeal from the decision of the Senior Fellow to the Chief Senior Fellow, and from the judgment of the latter to a commission composed of seven Senior Fellows, chosen from different parts of the jurisdiction. The commission is the supreme court of the order (Schiedgeticht). If the penalty imposed is a minor fine it is usually paid without question. Part of it is expended for drink, and the atonement is celebrated in convivial spirit. Should the fellow meet with an accident, or be overtaken by illness, medical care is provided at the expense of the lodge, if he is without means; and the Senior Fellow details brethren in their turn to nurse him until he is able to take care of himself, or until he dies. When the craftsman has completed his years of travel he may settle down in his hometown, or some other place to his liking, and is thereafter called a resident member (Einheimischer). But he does not relinquish his membership in the fraternity unless he becomes a master and goes into business for himself. But even as a master he is in close contact with the craftsmen's body, and is by custom bound to extend the hand of fellowship and do acts of courtesy to such members as may apply to him. Attention is here called to some peculiar rules of conduct followed by the members. Mention has already been made of the fact that the craftsman must not take off his black neckerchief while at work. If he finds it necessary to open his shirt collar, he simply opens the neckcloth and slips it down his bosom. It is considered bad form to work with sleeves rolled up; and it is regarded as highly improper for a fellow to go more than a house length from his lodging without coat or hat. We have already noted that the membership is divided into grades. The first, Junior Fellow, is conferred at initiation. From the time he commences travelling he is rated as a Fellow. After three years on the road he is recognized as an Old Fellow, and eligible to election as presiding officer of a lodge. No particular ceremony is connected with the last two "degrees," nor do they confer any distinction beyond that due to superior skill and experience. In the carpenter's calling the authority of the Senior Fellow does not extend beyond the lodge. In the shop or on the job every fellow is his equal. In this respect the craft differs from the Steinmetzen, whose foreman (parlier) in the shop became ipso facto the warden of the society. This is no doubt due to the fact that in the latter craft all grades were members of the same fraternity. Like the masons, the carpenters have their cowans. The latter call a travelling journeyman, who is not a member of the society, a "Vogtlander." The origin of the term is unknown, but it signifies one who is willing to work unusually long hours for low wages. In the reproduction of a clearance card issued by a lodge in Essen, 1904, note the seal, bearing the name of the fraternity around the outer edge, and the central design, composed of the coat of arms of the craft, viz. ; A plane between the extended compass, crossed hatchets, two adjacent squares, and, at the bottom, a saw. "Who can become an apprentice? Any man. Who shall be fellow craft? He who can. Who shall be master? He who can design and plan. What should a Travelling Fellow be? A true man." It would be interesting to examine this ancient society historically but the means are not at hand. It is claimed that its Brotherbook is several centuries older than that of the Steinmetzen, which was adopted in 1567 and there seems no reason to doubt the statement. The fraternity at present has no legendary history, such as we find in the Ancient Charges of Freemasonry, but it is more than likely that in former times such history formed part of the secrets of the craft, and that it has either fallen into disuse or been forgotten during those periods when the government attempted to suppress this and similar organizations. During the "blood-and-iron" rule of Bismarck all secret societies and clandestine meetings were forbidden, and though this order did not completely destroy the body, the members had to exercise great care to prevent the police from breaking up their meetings and lodging the members in jail. Why the black neckerchief? Is it a symbol of mourning for some traditional founder or martyr of the craft? Is it not possible that the original significance of it has been lost or forgotten? How many seamen of today are aware of the fact that the black neckerchief universally worn by the enlisted men of all navies, was originally worn in mourning for Nelson, and that the three white stripes on the naval seaman's shirt collar are commemorative of the three great victories won by that great seaman? It is my hope that in the near future we shall have available a copy of the carpenter's Brotherbook, which will enable us to form a clearer idea of the inner workings of their craft fraternity. Still work and hope for victory! Exactly what men think I am." We are indebted to the courtesy of Brother Joe Carson, of Riverton, Virginia, whose name is well known to our readers, for the privilege of publishing the illustrations presented herewith. This medallion is an item of considerable importance to antiquaries, since it is computed to be 405 years old. Thus far nothing has been published about it, so that it is hoped that among our own readers may be found those who may add something to the information furnished by Brother Carson, either by way of facts or of interpretation. Meanwhile a casual reader will find many points to challenge his speculative faculty by way of explaining the symbols and emblems exhibited in this rare old Masonic curio. What is the figure above the sun and moon in cut "A?" What signify the numbers 15 and 16? Why five steps? What is the object that lies at the foot of the stair, and looks like a coffin? What is the "X" shaped figure at the immediate left of the Sun? What is the winged figure supposed to be in cut "B"? 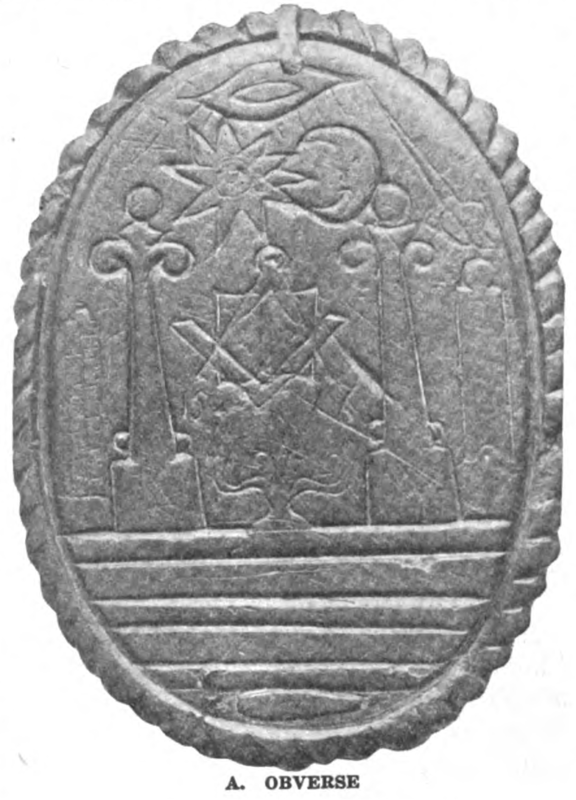 BELOW is the authenticated history of an old Masonic Medallion dated 1516, oval in form and beautifully carved with Masonic symbols and characters, found in the ruins of an old house in the townland of Derganyneville near Dromore in the county of Tyrone in the year 1912 by Mrs. Sarah Dowd, an old lady who lived beside the house in question as caretaker of a farm, the property of Mr. John J. Nelson, of Hackencon, Trillick County, Tyrone. The composition of the medallion is believed to be petrified oak, correct size 3&frac58; by 2¾ inches. "About the end of the year 1912 a little girl, a niece of mine, and myself, were picking out some stones from amongst the partly fallen ruins of the kitchen of an old house in Derganyneville when there fell out also a flat oval piece of something like slate, of a dark color and with a small portion of chimney soot adhering to it. Being struck with the peculiar shape of the article I picked it up from amongst the rubble, and thinking it rather a curiousity, I brought it to my employer, Mr. John J. Nelson, and told him how I had found; Afterwards, on the 8th of July, 1921, I was asked to meet Mr. Nelson and some other gentlemen at the said ruins, which I did, and pointed out the exact place where I found the article." 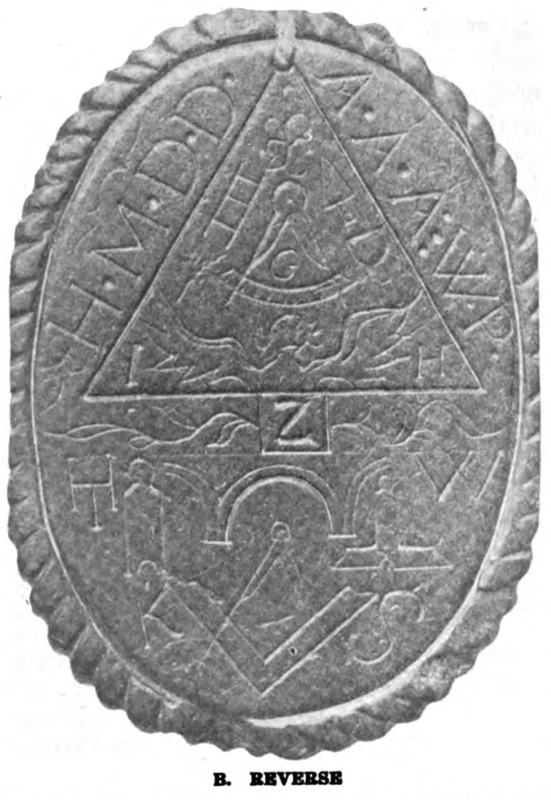 Mr. John J. Nelson's statement corroborates that of Mrs. Dowd, and he further states that after he had washed the soot and dirt off the medallion he recognized the carving as having something to do with Freemasonry, as although not a member of the Order himself, a Mason lodge met in his father's house when he was a young lad, of which his father was a Past Master, and the Master's chair with Masonic emblems carved thereon was for several years after his father's death and the winding up of the lodge, preserved in the family, but eventually became broken up and lost. Mr. Nelson kept the medallion in his private drawer for some years, when happening to turn it up while looking for some papers, he put it in his pocket and brought it to his old friend and neighbor, Mr. John R. Henderson, of Lisnahanna, Trillick, whom he knew to be a Freemason and whom he surmised, would be interested in it, which proved to be the case, for Mr. Henderson, or, we may now say, Brother Henderson recognizing its evident connection with early Masonry sent it by the hand of Brother Davis Graham, to Brother Robt. W. Wilson, then acting as Grand Secretary to the Provincial Grand Lodge of Tyrone and Fermanagh, who had it immediately photographed, and who also submitted it to several of the leading members of the Lodge of Research, who were all intensely interested in what they deem a rare and valuable Masonic curio. The authenticity of the foregoing history of the same is vouched hereby by us who were present at the interviews with Mrs. Dowd and Mr. Nelson, and at the taking of photographs of the spot and of the parties named herein on the 8th day of July, 1921. John R. Henderson, Trillick, P. M. Lodge 58, Trillick. David Graham, Enniskillen, P. M. Lodge 473, Enniskillen. James Henderson, Lisnahanna, Trillick, Dolph Lodge No. 80, Athena, Oregon, U.S.A.
John Mercer, Enniskillen, Lodge 891, Enniskillen. Robert W. Wilson, Enniskillen, P.M. THE CRAFT has always attracted to its ranks men of erudition and leaning, and one of the most honoured of such is that of Martin Folkes, Deputy Grand Master, 1724. It was perhaps fitting, in view of the interest he is said to have taken in Freemasonry and the influence he is reported to have had, that Martin Folkes should have been born in Queen Street, Lincoln's Inn Fields, the only home the Grand Lodge of England has known since it had a home of its own, the date of his birth being 29th October, 1690. He was the eldest son of Martin Folkes, an eminent lawyer and a bencher of Gray's Inn, described in the Gray's Inn Admission Register as of Rushbrooke, County Suffolk, and admitted 18th May, 1661. In 1695, Martin Folkes, senior, became Solicitor-General and, in 1697, Attorney-General to Catherine, Queen Dowager of Charles II. The mother was Dorothy, the second daughter of Sir William Hovell, Kt., of Hillington Hall, near Lynn, Norfolk. The family of Folkes is known to be of Staffordshire extraction and the first member of whom there is any record is William Fowke, as the name was anciently written, who was of eminence in Staffordshire in A. D. 1438. When a boy of nine years, Martin Folkes, the subject of this sketch, was sent to the University of Saumur, and his tutor, Cappel, the son of Lewis Cappel, a celebrated Hebraist, described him as "a choice youth of a penetrating genius and master of the beauties of the best Roman and Greek writers." Soon after, in February, 1706, at the age of seventeen, he was sent to Clare Hall, Cambridge, under the care of Dr. Laughton, where he made great progress in mathematics and other studies, and after gaining his baccalaureate, he proceeded to the degree of Master of Arts on 6th October, 1717. Some estimate of his progress at the University may be made from the fact that he was only twenty-three years of age when he was, on the 29th July, 1714, elected a Fellow of the Royal Society, his name having been accepted for nomination on the previous 13th of December. A little more than two years after his election — on 30th November, 1716 — he was chosen as a member of the Council of the Society, an honour renewed annually until 1727, and, in 1722, an addition was made to the distinction by his appointment by the President, Sir Isaac Newton, as one of the Vice-Presidents. Folkes often presided at the meetings in the absence of his chief and on one occasion he was told by Dr. Jurin, the secretary, who dedicated to Folkes the 34th volume of the Transactions, that "the greatest man that ever lived (meaning Sir Isaac Newton) singled him out to fill the chair and to preside in the Society when he himself was so frequently prevented by indisposition, and that it was sufficient to say of him that he was 'Sir Isaac's friend.'" On the death of Sir Isaac Newton, in 1727, Sir Hans Sloane and Martin Folkes competed for the presidency, the latter being unsuccessful. In 1729 Folkes again became a member of the Council and, in 1732 and 1733, was asked by Sir Hans Sloane again to accept a Vice-Presidency, which he did, and, on 30th November, 1741, he succeeded Sir Hans Sloane as President. He presented the Society with a fine portrait of himself, painted by Hogarth. The author of the History of the English Stage also describes her as "one of the greatest and most promising genii of her time" and says that she was taken off the stage by Mr. Folkes "for her exemplary and prudent conduct." Unhappily many years before Martin Folkes' demise the wife became mentally unbalanced and had to become the inmate of an asylum. In 1719 Folkes was elected a Fellow of the Society of Antiquaries, afterwards becoming a Vice-President. When Algemon, Duke of Somerset, for many years President of the Society, died on 9th February, 1750, Martin Folkes was immediately chosen to succeed him, in which office he was continued by the Charter of Incorporation, which was granted on 2nd November, 1751. It was Folkes himself who, in conjunction with Lord Chancellor Hardwicke, obtained a Charter of Incorporation for the Society. Prior to his election as President of this body, Oxford had conferred upon him the Doctorate of Civil Law, and Cambridge, his alma mater, the Doctorate of Laws, when on the occasion of a visit from the Chancellor, the Duke of Newcastle. It is said that when he was "capped" at Oxford, he returned them "a compliment in a Latin speech, admired for its propriety and elegance." Folkes was also an associate of the Egyptian Club and a member of a literary club, known as the Spalding Society. He was the patron of George Edwards, the naturalist, and gave some help to Theobald for his Notes on Shakespeare. At one time he had an ambition for Parliamentary honours, for he contested Lynn as a Whig in 1747. Dr. Robert Smith, Master of Trinity College, Cambridge, 1736, and preceptor to William, Duke of Cumberland, was indebted to Folkes for some curious information which he embodied in his great work on Optics and acknowledged in his Preface to the quarto edition published in 1738. Folkes also edited C. Maclaurin's Treatise on Algebra. He was renowned as a numismatist and had a famous collection of coins and medals. On his travels through Italy he compiled a Dissertation on the Weights and Values of Ancient Coins. The only copies of his works in the British Museum are: 1, a Table of English Gold Coins from the 18th year of King Edward III, with weights and values, London, 1736, 4to. 2, A Table of English Silver Coins from the Norman Conquest to the present time, with weights, values, and remarks, 1745, 4to- 3, Tables of English Silver and Gold Coins, in three parts, 1763, published after his death. "1725, Tuesday, 9th February. Bob Ord came in while I was writing and I went to him to the Club in Paul's Church Yard, where were Mr. Brown, Derham, White, Glover, Heathcote, Graham, Foulkes, and another: we talked about the 'Religion of Nature delineated,' the character of which book I asked Mr. Brown." "1725. Tuesday, 9th March. Thence to the Club in Paul's Church Yard, where we had two barrels of oysters, one before and another after supper, Mr. Leycester, Glover, White, Bob Ord, Graham, Foulkes, Sloan, Derham, Heathcote, a talking gent. I had never seen there before; paid 2s. 6d. a piece. Mr. Brown they said had got the gout. We talked much of something and nothing, about Dr. Vincent's copying of letters, and I told them I was going to establish a Cabala Club that were guessers." "1725. Thursday, 11th March. When we were at dinner the Duke of Richmond and Mr. Foulkes [came in]. . . . The Duke of Richmond was very merry and good company; Mr. Foulkes just mentioned my having found out shorthand, but nothing more was said on it then. I came to the Society in the coach with the Duke of Richmond, Mr. Foulkes, and Mr. Sloan and we talked about Masonry and Shorthand." "1725. Tuesday, 6th April . . . to Paul's Church Yard, where Mr. Leycester and I went, Mr. Graham, Foulkes, Sloan, Glover, Montagu. . . . I had a scallop shell and Welsh rabbit. Mr. Leycester and I walked home together. There was a Lodge of Freemasons in the room over us, where Mr. Foulkes, who is Deputy Grand Master, was till he came to us. Mr. Sloan was for taking me upstairs if I would go: I said I would, and come back if there was anything I did not like and then he bid me sit down." "1725. Tuesday, 29th June. Mildmay and I went to the Sun in Paul's Church Yard, it was past ten when we came there; there were twelve of us only, Foulkes, Graham, Brown, Derham, Bob Ord, Sloan, Heathcote, Hauksbee, Dr. Anteney, and a stranger that Mr. Foulkes brought. . . . Mr. Foulkes said that Dr. Stukeley had said that he could read the Egyptian hieroglyphics as well as English,"
"I am very much asham'd when I think how long I have defer'd answering your two obliging letters, especially when I consider that I ought to have writ first to thanks you, as I do now, for the goodness you have had in letting us have your company here at Goodwood, but staying so little a while is but tantalizing us, for as soon as one had the pleasure of your acquaintance, your affairs oblig'd you to go. But next summer, if I return to Sussex, you will, I hope, remember your promise of staying some time with me, in being my Squire. I fear the fatigue you underwent, might hinder the pleasure of the entertainment. I wish it lay in my power to show you in a more essential way, how great a value and friendship I have for you. I have been guilty of such an omission that nobody less than the Deputy Grand Master can make up for me. . . . I desire you would present my humble service to Mrs. Folkes. I hope she was entertained at the Instalment." "With much ado I obtain'd leave to transcribe the following account relating to Mrs. Folkes out of a letter that came from abroad, having first sworn no to tel the person that sent it. "This is al that was read to me out of the letter. I could not help saying, what I fancy you'l join with me in, Poor Martin! In an evil hour didst thou take to thy bosom this Lady Mar-all." The Duke of Richmond gave Martin Folkes a letter of introduction to Princess Pamphili, in which he spoke of him as "a gentleman of very good family, and one of the leading savants of this kingdom." "I may venture to say that this letter will be attended with one agreeable circumstance to your Excellency which is that of introducing one of the most learned and at the same time most agreeable men in Europe to you, besides this he is one of the most intimate and dearest friends I have in the world, which I am vain enough to hope will not lessen him in your Excellency's esteem. His name is Mr. Folkes: he is a member of our Royal Society and has been a great while our Vice-President, he was an intimate acquaintance of the great Sir Isaac Newton, for whose memory, as every man of learning must, he has the utmost veneration." "In February 1740, James Anthony Dossier, a nephew of Jean Dossier, engraver to the Mint at Geneva, published proposals for executing several medals of famous men living in England. The set was to consist of thirteen medals and the subscription to be four guineas, but if sold singly, the price was 7s. 6d. each. The medal of Martin Folkes was first made. The dies were engraved in London, but the medaig were struck abroad, because no engines were allowed for that purpose in this country." "Was executed at Rome, and, tradition says, by especial command of the Pope, unknown to Folkes whom it was intended to surprise during his visit to Italy. Freemasonry was originally named 'Lux' and is said to have existed from the Creation. Folkes' visit to Rome took place in 1733. It is much more probable that the medal was struck at Rome to show the high esteem in which Folkes was held in that city of antiquities and about the time he was elected a member of the French Academy. There is in the British Museum an early proof of this medal struck before the legends were added or the type of the obverse finished." The Papal tradition obviously is without foundation. Clement XII occupied the papal chair in 1733, and Benedict XIV in 1742, and both condemned the Masonic Order in unmistakable language, so that it is scarcely likely that either would sanction the issue of a medal in honour of so distinguished a Freemason. This medal by some means left the possession of the Folkes family, but, about 1890, it was recovered by Bro. Sir William Ffolkes, Bart., a lineal descendant, whose brother-in-law found it in a curiosity shop in Norwich. In the History of the Philanthropic Lodge, No. 107, King's Lynn, published in 1911, it is stated that "Sir William Ffolkes has in his possession a bronze medal, which was struck in honour of Martin Folkes by the Masons resident in Rome in the year 1742, and also an original letter from the Duke of Richmond to his Deputy, Martin Folkes, asking him to make his excuses for not attending to a report from a Charity Committee, and thanking him for an old record he had sent him, which he stated was really very curious, and a certain proof of Masons' antiquity by the Unbelievers. Martin Folkes constituted the Maid's Head Lodge, the earliest Lodge on the roll of Norfolk Freemasonry [No. 30 in the 1725 List, erased in 1809.-D. W.] and his name appears in the first list of members in 1725." S. Russell Forbes says (Ars Quatuor Coronatorum, xiv) that Martin Folkes founded a lodge in Rome in 1742 and named it after Fabius Maximus. "He had a medal struck at the Papal Mint, engraved by Hamerain. On the obverse is his bust, and on the reverse a sphinx in the foreground, on the side of which is the crescent moon. Behind is the pyramid tomb of Caius Cestius, thus a rectangle is introduced twice, as two sides of the tomb are shown. At the northeast and northwest corners of the pyramid are two columns, so the tomb and columns might suggest the temple. In the south the sun shines in full splendor, above all is the motto, Sua sidera norunt. At the base is Romae, A.L. 5742." On the 5th September, 1742, Martin Folkes had been elected a member of the French Academy, to fill the vacancy caused by the demise of the celebrated Halley, and, in the words of the Minute "the Academy thought it could not better repair the loss than by the election of M. Folkes in his place." The Minute also mentions in terms of high praise his communications to the Royal Society on the subject of Weights and Measures. Weld in his History of the Royal Society also says that "Martin Folkes was a man of extensive knowledge, who has, however, rendered more service to archaeology than to science; the latter being chiefly enriched by his work on the intricate subject of coins, weights, and measures." "Resolved: That the thanks of the Society be returned to Martin Folkes, Esq., their worthy President, for the many great services which they have received from him, both as Member and as President, of which they shall retain the highest sense. And that he be assured of the great concern which they feel that his ill state of health will not permit him any longer to discharge the office of President, which he has so many years filled with so much credit to himself and advantage to the Society." "They are a most elegant and agreeable entertainment for a contemplative person: here we meet, either personally or in their works, all the geniuses of England, or, rather of the whole world, whatever the heavens present. My custom is, when I return home and take a contemplative pipe, to set down the memoirs of what entertainments we have there." Martin Folkes was succeeded in the Presidency by the Earl of Macclesfield, who, from the time of his election to the Council evinced a warm interest in the Society. "It is but just to Mr. Folkes to state that he left the Society in a much more flourishing condition than when he was elected President; for, at the time of his resignation, their funded capital amounted to 3,000 pounds. A careful examination of the voluminous Minutes of the ordinary meetings, extending over the eleven years that he was in office, enables me to state that he was scarcely ever absent from the chair, and that the meetings were honoured by a greater number of visitors than usual, numbering frequently as many as thirty or forty. Indeed, so much inconvenience was occasionally experienced by the crowds desiring to be admitted, that the President was obliged to request the Fellows to exercise a little discretion in bringing visitors and to enforce the standing order precluding their admission until leave had been obtained from the Society in the usual manner." On the 26th September, 1753, Martin Folkes was seized with paralysis, as a result of which he was deprived of the use of his left side. In this unhappy situation he lingered on until 28th June, 1754, when a second stroke put an end to his mortal career. He was buried in Hillington Church near Lynn, in Norfolk, under a black marble slab in the chancel, with no other inscription than his name and the date of his death, in accordance with the provisions of his last will, dated September, 1751. He bequeathed 200 pounds to the Royal Society, in addition to a cornelian ring, on which was engraved the arms of the Royal Society, for the use of the President. He also bequeathed 400 pounds a year for life to his wife and he left, 12,000 pounds to each of his daughters. In 1792 a monument was erected to him in the south side of the choir of Westminster Abbey. "This morn, about four, dyed Martyn Folkes, of a repeated paralytic stroke. He had just finished his new house adjoining to his own in a most elegant manner, though always incapable of having the least enjoyment from it. He has remained for this three or four year a most miserable object of dereliction from that Deity which he supposed took no account of our actions and had not provided for an immortal part." "Martin Folkes has an estate of near 3,000 pounds got by his father-in-law. He is a man of no economy. Before at age he married Mrs. Bracegirdle off the stage. His mother grieved at it so much that she threw herself out of a window and broke her arm. His only son broke his neck off a horse back at Paris. His eldest daughter ran away with a bookkeeper and who used her very ill. Quarrelling with Sir Hans Sloane about the Presidentship of the Royal Society and being baffled he went to Rome with his wife and daughters, dog, cat parra, and monkey. There his wife grew religiously mad. He went to Venice and got a dangerous hurt upon his leg. Returning he was successor to Sir Hans Sloane, President of the Royal Society. Losing his teeth he speaks so as not to be understood. He constantly refuses all papers that speak of longitude. He chases the Council and officers out his junto of Sycophants that meet him every night at Rawthmilis coffee house, or that dine with him on Thursdays at the Miter, Fleet Street. He has a great deal of learning, philosophy, astronomy; but knows nothing of natural history. In matters of religion an errant infidel and loud scoffer. Professes himself a godfather to all monkeys, believes nothing of a future state, of the Scriptures, of revelation. He perverted Duke of Montagu, Richmond, Lord Pembroke, and very many more of the nobility, who had an opinion of his understanding; and this has done an infinite prejudice to Religion in general, made the nobility throw off the mask and openly deride and discountenance even the appearance of religion, which has brought us into that deplorable situation we are now in, with thieves and murderers, perjury, forgery, etc. He thinks there is no difference between us and animals; but what is owing to the different structure of our brain, as between man and man. When I lived in Ormond Street in 1720, he set up an Infidel Club at his house on Sunday evenings, where Will Jones, the mathematician, and others of the heathen stamp, assembled. He invited me earnestly to come thither, but I always refused. From that time he has been propagating the infidel system with great assiduity and made it even fashionable in the Royal Society, so that when any mention is made of Moses or the deluge, of religion, Scriptures, etc., it generally is received with a loud laugh. In September, 1751, being of a very gross habit, great eater and drinker, he was seized with the cholic, which soon terminated in a hemiplegia. He has now been confined a twelvemonth in this miserable state, but so far from correcting his irreligious notions that he's grown worse if possible. In two years time he dyed in a deplorable manner. Two years after his daughters both married to indigent persons." "Mr. Johnson talked about the Duke of Montague and I walked with him through the Strand and he said Martin Folkes talked strangely about religion." "Probably against religion as he had seen it exhibited in Rome and Florence, where he had resided two years and had lately returned (September, 1735) to England." Martin Folkes destroyed many manuscripts shortly before his death, some of which, it is thought, would have thrown light upon the early history of the organized Craft in England. His library was sold by Samuel Baker, of York Street, Covent Garden, W. C. The sale began on Monday, 2nd February, 1756, and continued for forty days. There were in all 5,126 items, the sum realized being £3,091 6s., which was a large sum in those days, although a great many items were withdrawn from the sale. The present family of Ffolkes descends from Martin Folkes' brother, William Folkes, barrister-at-law of the Inner Temple, agent to the Duke of Montague in Lancashire, who married, as his second wife, the only daughter and heiress of Sir William Browne, President of the Royal College of Physicians. There was only one child of this marriage, Martin Folkes, who changed the spelling of his name and styled himself Martin Browne Ffolkes after the death of his grandfather. He was created a Baronet on 26th May, 1774. The present bearer of the title, Sir William Edward Browne Ffolkes, is the fourth Baronet and brother of the third Baronet, who had only one child, a daughter, now the wife of Lieut.-Col. the Hon. John Dawnay. The present Rector of Hillington — the Rev. F.A.S. Ffolkes, M.V.O., J.P., Chaplain in Ordinary to the King and Chaplain of the King's Own Norfolk Yeomanry, is a brother of the present Baronet. THOUGH this is admittedly a commonplace, it is undeniably true, — that we live in a very busy time. The conditions of hustling modern life force us, whether we will or no, to fill our days and hours with a multitude of activities; and even then to leave undlone many desirable things. Very desirable, we believe, are our fraternal activities; yet even in these circles we find duplicated these same hustling conditions of all other phases of life. There are many lodges, and they all clamor for attention. Such attention as we give must be carefully bestowed. Careful attention we believe we have given to our Masonic organization; yet even here we find more or less of this overfilling of our available time. Within Masonic circles any new organization, even though auxiliary, may well be received with caution. Energy and attention needed for the main lines of Man sonic activity should not be lightly scattered and carelessly divided. Any new club must fully justify its existence if it is to be received, approved and made permanent. These conditions would seem to discourage the addition to our system of a new unit such as our Fellow Craft Club. This club, however, was the outgrowth of these very conditions, helping somewhat to meet their problems which we are facing. Among the undoubted problems is that of the gradual change in our lodges brought about by new needs. Our lodges, becoming larger and larger, must serve this larger membership. This growth in membership brings a constantly increasing number of petitions and candidates, and this necessitates more frequent meetings. The time of our busy officers, mortgaged to the degree work and the duties incident to a large membership, is hardly sufficient to meet the needs that are urgent. These needs, however, are merely the more insistent ones. Others arise from the fact that to a certain extent the lodge, standing less alone in the community than formerly, must compete with many other activities which are bidding for the attention of busy men. Many men, we must confess, are not interested for very long in the degree work alone, and their interest must be maintained by an emphasis on the social features which make gatherings of men attractive. Out of such conditions grew our Fellow Craft Club. It was formed primarily for the purpose of assisting the Master in his lodge work, and then for the purpose of doing some things which the Master could not find time to accomplish. The club was first but a small group of men with enthusiasm for our lodge. The work, once started, grew, revealing new possibilities for service which were met as they appeared. The by-laws (we were ambitious enough to believe we needed them) are simple, providing just enough organization to accomplish our purpose. The work, not the machinery, is emphasized. The by-lays state: "The object of this organization shall be to promote the welfare of _____ Lodge. "Sect. 1, By assisting the officers of the lodge in the presentation of degrees, especially the Third degree. "Sect. 2, By assisting the Senior Deacon in welcoming and introducing visiting brothers. "Sect. 3, By providing means of entertainment and refreshments at such communications as the Worshipful Master shall direct." Certain requirements for membership are provided. The Junior Warden of the lodge is automatically the Club Leader, but emphasis is placed on the fact that the authority of the Worshipful Master is absolute in all the affairs of the club. Other useful matters are worked out in these by-laws. Our club is accomplishing several of its purposes. In connection with the degree work it furnishes and organizes men for the Fellow Craft team in the Third degree. For this work we have enough interested men so that it is possible always to have the necessary twelve. Not only for the Third degree, but for other meeting nights also, the club members have been appointed in rotation on reception committees, a past master when possible acting with them. This committee welcomes all who attend our meetings to make them feel that their attendance and interest are appreciated. Especial attention and appreciation are of course given to strangers. The stranger is introduced to those who may be at liberty, an examining committee is arranged if he is making his first visit, and after the examination he is placed in charge of some brethren who look to his pleasure during the rest of the evening. Every brother who is a member of another lodge is marked with a small bow of blue ribbon on his coat lapel. This badge, marking him a visitor and being automatically an introduction to every brother present, smooths the way for easy acquaintance and informal welcome. Particularly has the Fellow Craft Club taken responsibility for the social side of lodge life. Lunches and smokers following lodge meetings have been arranged and managed. At these affairs, delightful in their informality, there is often a speaker who for a few minutes speaks entertainingly, after which the men themselves either ask questions, continue the discussion, or indulge in general conversation. The club has arranged a few dances during the winter season. These have been simple and inexpensive, and have interested many who were not permanently attracted by the ritual work. This summer, indoor lodge activities being unseasonable, the club took the lead in the arrangements for a successful picnic in which all the appendant Masonic bodies of the city joined. The club has found it desirable, however, to preserve for itself organization enough to prevent the feeling that it is merely a group of committees. To this end the officers have arranged a monthly meeting for the discussion of plans and policies; and in connection with this meeting have introduced an initiation for the new members. The club being largely social, it has not been felt that the initiation need carry any very serious import. It is not even remotely suggestive of any Masonic degree work, that being too sacred to be trifled with. This little initiation employs amusing and entertaining features without degenerating into anything undesirable, yet closes with a dignified climax. Containing amusement and a little instruction, it has added greatly to the interest of the club. We find that the club has awakened and maintained an interest in many men by giving them something to do. It has scattered rather widely among them the social duties and responsibilities, as well as the incidental work of the lodge. Many men do not care to hold Masonic office. Many more are not fitted for the peculiar requirements of such responsibility. But almost every man being interested in his lodge, we find that most of them are glad to do the things which this club fosters. We are but beginning, and find that there is a large field of activity not yet touched, Many more things might with benefit be done. The many branches and forms of Masonic study and instruction remain for future development, which might with entire appropriateness be fostered by the Fellow Craft Club. The discussions following the regular meetings could be systematized, extended, and made more important. Subcommittees might well care for and handle the properties for the various degrees, thus saving time and making for general efficiency. Some work along dramatic lines would be valuable. College dramatic clubs have shown us how to make this work useful and pleasant, indicating a field where entertainment and valuable training are combined. As an approach to this work the club might develop degree teams to understudy the officers for the various degrees. This would give a taste of degree work to those who do not care to assume official responsibility, and would perhaps develop good material for officers. A committee of the club might bring to the meetings of the lodge those who are normally shut in by some handicap and so deprived of lodge life. The club could do much to keep in touch with every Mason resident in our city but belonging to a lodge elsewhere. This would extend Masonic courtesy in a very pleasing way. We have found that our work grows with experience, each new step determining the direction of further progress. In general our Fellow Craft Club has worked well. It has proved its worth and usefulness by adding to the efficiency of the lodge. By keeping itself strictly subordinate to the lodge it has not been subject to any of the criticisms which would justly condemn any competing or disturbing organization. It has kept its reason for being strictly in view, has tried to do its legitimate work, and has held itself strictly to the desires and plans of the Worshipful Master. It seems to us to have great possibilities for growth and extension and for added usefulness to our lodge. To summarize. The fact that we live in a very busy time, and that our lodges are growing rapidly, brings important problems! Any new organization must justify the time we give it by being useful. The Fellow Craft Club tries to help the Master to solve some of his problems by giving him active assistantance. It has a simple organization, and holds itself strictly subordinate to the Master. It furnishes a Fellow Craft team. It provides reception committees for communications, with especial reference to visitors. It arranges social affairs following meetings. It has arranged winter dances and a summer picnic. It has its own meetings, with a diverting initiation. It has interested men by giving them duties. Still further work remains to be done. A moment white, then lost forever. WHEN in the course of human events the mass of people living in a nation learn how to live together as a people, and devise means whereby to secure for themselves their rights as a people, and contrive political machinery and social institutions of such character as exist by and for the whole mass of individuals, that land may be said to be a democracy; for democracy may be described as a state of society in which the people as a whole control in their own collective interest the institutions and forces of the nation. No nation becomes democratic by first thinking out a theory of what democracy is and then, as an architect follows a blueprint, deliberately setting out to put the theory into practice; but they arrive at democracy very gradually and naturally, though not always without strife, by securing control of one thing and of another until they have control of everything, mad then manage everything so as to satisfy the needs and desires of the people as a whole. Some nations long for democracy, others are on the way to democracy, and others still may be said to possess it, albeit in no nation has it as yet become perfect. The most conspicuous among these last is, perhaps, our own country. It was the first great nation to adopt democracy whole-heartedly, and it has from the first never swerved from the path that leads to a more and more complete control of everything by the people themselves and in their own interests. Whether one should describe as democratic a nation that merely longs for it, or whether the name should be exclusively applied only to those nations which may be truly said already to possess it, must be left to the individual's opinion to decide. The use of words is one thing, facts are another. The organization of public life by and for the public — that is what we Americans all our hearts, unless we are renegades, and that is what we American Masons, with an equal whole-heartedness, believe the Masonic Fraternity to stand for. Do you find Brother Haywood's definition of democracy to be adequate? If not, how would you enlarge or modify it? How can a people ever be said to control their own life when always a minority, sometimes large, sometimes small, is opposed to the course of the majority? Is majority rule the same as democracy? Can you name a nation now existing which is trying to secure democracy? Name two nations now "on their way to democracy." Would you describe the soviet government of Russia as a democracy? What kind of a government did Alexander Hamilton wish us to have? What sort of a nation did Thomas Jefferson strive for? Were they both democrats? Do you believe that the mass of the citizenship of this nation is competent to manage its own affairs? A French writer (Fauget) describes democracy as "the cult of inefficiency." Do you agree with him? Or do you agree with President-Emeritus Eliot of Harvard University that democracy is the most efficient of governments? Now it is self evident that there may be many means whereby the public as a public may come into control of its own social forces and institutions. How democracy is to be won and preserved is a question of political and social machinery, and that is a question that cannot concern us here because it belongs to politics. Suffice to say that it is possible for the people directly to manage their own institutions, as in some cities the price of a street car ride is determined by popular ballot, which is usually described as "direct democracy," and that it is also possible for the people to control their own institutions through elected representatives as is usually done among us, which method is called the "republican" or "representative" system. In our own nation we mix up the two methods very much and the United States might be properly described as a democracy in the form of a republic. What is meant by political science? What is sociology? What is economics? Give examples from your own knowledge of "direct democracy." Of "representative democracy." Can you explain the difference between the Democratic Party and the Republican Party on this question? The Study Club member may have been wondering why it should be necessary to include in this series a paper on democracy when the course includes two other papers on equality and liberty respectively. Well, it may be said in reply that while democracy includes equality and liberty, equality and liberty may exist without democracy, and that in our nation, and also I believe in our Fraternity, we strive for all three together. Liberty means that a man is free to develop and use the functions of his own nature without undue interference from others. Equality means that one man has the same fundamental nature as another man, and should have the same privileges to live; but it has often happened that a social structure has existed in which only a minority of the people have been permitted to enjoy either liberty or equality. In Athens, for example, a fraction of the populace was composed of citizens enjoying liberty while the great bulk of them were slaves, and in many parts of India, to cite an example of the other kind, all the individuals enjoy liberty but, owing to a very hard-and-fast caste system, they do not have equality. The democrat (this must not be confused with the member of the political party which employs that name) believes that liberty is a good thing for each individual and that therefore a state should guarantee it to all, and he also thinks that the state should Provide genuine equality for all. A state in which all the social forces and values are controlled by and for all the people, and which is so organized at the same time as to guarantee for all liberty and equality, may be thought of as the ideal toward which all true democrats are working. If it be true, as I think it is true, that Freemasonry is one of the mightiest forces working in that direction, we may all feel that no institution could be of more value to our nation than Freemasonry. We must be careful not to conceive of democracy being merely political. I should advance this as a criticism of James Bryce's definition in his recent treatise, already seen to be a great work, called "Modern Democracies." He says that "Democracy really means nothing more nor less than the rule of the whole people expressing their sovereign will by their votes." That is clearly a merely political definition. Democracy is oft something besides a "rule": it may be an expression of the popular life, as in what we call democratic art, like the "Leaves of Grass" by Walt Whitman; and when it is a rule it may be exercised in quite other ways, as when social changes are brought about or prevented by the power of public opinion; and also it often happens that the mere unconscious growth and changing of a people may transform important conditions in a nation's life. Then, too, I think one should quarrel with Viscount Bryce's definition in that it ignores such things as social democracy, industrial democracy, and intellectual democracy. By social democracy we mean that social customs and conditions should be controlled and shaped by all the people in the interests of all the people. By industrial democracy we mean that industry shall be controlled by and in the interests of everybody; and by intellectual democracy we mean that there shall be no mere caste of thinkers as there was in Ancient Egypt but that everybody will use his brains and that science and scholarship exist for all and by all. The organizing of science and scholarship in public schools which function under the control of the state is an example of how the intellectual life may become genuinely democratic. How all these things may be accomplished or perfected is a question of ways and means, and belongs to those discussions in which we strive to discover what are the most perfect social mechanisms, and therefore do not come within our present province. It is wise for us to learn to look at the facts themselves, and do our own thinking by means of them, rather than to let ourselves be deceived by words. For oftentimes it happens that a nation may call itself a democracy or a republic and yet have not even a tithe of the reality for which these names stand. Mexico under Diaz may have had a very stable government but it was not a democracy, though Diaz and his grandees were careful to observe the formalities, and carried on "elections" every once in a while. Diaz called himself a "President" but in reality was a dictator. In England, on the other hand, there is a king and a royal house but everybody knows that the English people are quite as democratic as we are, because their great governing body is immediately responsible to the people, and is elected directly by the people. Can you tell in what ways some of our own social institutions are not yet democratic? What is a social institution? Name five. Do you believe that industry should be socialized, or brought under public control? Is this the same as Socialism? If not, in what way does it differ? How could industrial democracy be brought about? Can you name any country that calls itself a democracy which is really not? Name a democratic country that still has a king but is really democratic. Is Belgium a democracy? It may be safely said that Freemasonry is about the most democratic institution in existence. On its lodge floor men of all grades of rank, wealth and influence meet together in absolute equality, so that Presidents of the United States have sat on the side lines while some humble workman governed in the East. Its members are elected by secret ballot; its officers are chosen by ballot also; and it is governed by laws administered through representatives who must, once a year, give an account of their trust to the body of the membership. It is so organized that its responsibilities and privileges are equally distributed among the whole membership so that all share equally. The democratic nature of the Craft is shown by its actual conduct in history during the past two hundred years. It arose in England (I refer here to modern speculative Masonry as we now know it) when society in general hated and loathed the idea of democracy, and when men were broken up into social classes of such rigidity as really to constitute genuine castes; but in its lodges it gave to every man absolute freedom of thought and expression and it put into practice those methods of popular rule which we have now in our government. Since its reorganization in 1717 it has always thrown its weight, or at least with very few exceptions if any, on the side of popular rule. I had occasion recently to read every reference to Freemasonry in the Encyclopedia Britannica, and I was struck by the fact again and again that the Fraternity received mention almost every time as being one of the forces on the side of a revolt against tyranny in some country, as, for example, in Spain and in Belgium. We know how that a great many of the founders of our nation were active members of the Craft; how that the Declaration of Independence has been freely described, even by the profane, as a Masonic document; and how it can be accurately said that the Constitution of the United States is Masonry put into political practice; and we also know that Masons were very active in tormenting and carrying through the American Revolution. My friend and colleague, Cyrus Field Willard, of San Diego, California, has prepared a paper on "The Origin of the Scottish Rite" which is to be published in these pages, in which he shows that European Jews of great wealth were so anxious to see organized here a democracy in which they could have full citizenship and never be in danger of persecution that they poured vast sums of money into the coffers of the Revolutionary government; and that they made use of lodges, and organized many such, in order to carry on their work through Masonry. The teachings and principles of Freemasonry can never be realized in any state of society save a democratic one. How could there be equality for all in a nation ruled by a class, or a caste, or a clique of bureaucrats, or a set of multi-millionaires? How could liberty be guaranteed to every last man in a nation that did not govern itself through laws that apply equally to all, and are interpreted and executed by men chosen by the people and responsible to the people? In any other kind of government liberty and equality may be granted for a time as a privilege but there is never any way of knowing, as history itself so abundantly attests, when that privilege will be withdrawn. The foregoing mention of the Scottish Rite reminds one of Masonry's great book, Albert Pike's "Morals and Dogma." Those who have carefully read that wonderful work ("those" should include every Mason, whether he be a member of the Scottish Rite Bodies or not) will recall how that liberty and equality sound through its pages over and over like a mighty bell, and how that the author interprets the whole of history as a vast conflict between the forces that make for tyranny and the forces that make for freedom. It is often asked why Scottish Rite Masonry makes such headway in Latin countries where Ancient Craft Masonry (the "Blue Lodge") stagnates: I believe the reply to be this, that Albert Pike and his co-founders of the Scottish Rite System organized a Masonry that may be readily translated into a people's yearning for political freedom. They read in its mighty palimpsest their own prayers for liberation; they find in it a power for emancipation; it is an irresistible force for the overthrow of thrones and dominions. But is must not be supposed that Freemasonry works for democracy only when it is engaged in some actual struggle, as it was during our Revolutionary period. Its silent and perpetual influences, quiet as the coming of the night, unostentatiously prepare in every Masons mind those thoughts and feelings which make toward democracy. It has become a commonplace with political thinkers that democracy cannot come to any people until they have prepared themselves for it. It is not a magic that acts independently of the citizenship; it is a thing that people themselves do if it be done, and it cannot be unless they learn how to do it, and until they desire it with a ceaseless desire. A great Order of more than two and one-half million members in this nation exercises an immeasurable influence toward a full and complete democracy by constantly instilling into its members those ideas and longings which inwardly prepare them for the fullest measures of equality and liberty. As the sun works so potently in the spring in developing the young seeds until a luxuriant vegetation breaks forth, so does the mighty Order that is dedicated to Light throw its fructifying warmth about the mind and heart of everyone of its children. And it does this ceaselessly. It knows no seasons: it has no winter. Democracy, I said, is not a kind of magic that works whether or no. It is not an infallibility. When the people govern themselves they do not escape mistakes nor are they miraculously freed from weaknesses and evils. The theory of democracy is that the people can learn to govern themselves only by governing themselves, just as an individual learns by experience and experiments. Therefore though the people, or let us say "we," may fail, time and again, that is no reason for despairing of democracy. In the foregoing section are mentioned a few ways in which Freemasonry is democratic; can you name others? Can you give examples of how Freemasonry has actually fought on the side of political liberty? Why can't a democratic institution like ours flourish in an undemocratic society? What is the principal idea in Pike's "Morals and Dogma"? What does that name mean? Has Freemasonry made you more democratic? How can one carry out the ideals of democracy in every day conduct? How would you change Masonry to make it more democratic? Could it be made more democratic? Free, p. 280; Free and Accepted, p. 281; Free Born, p. 281; Freedom, p. 281; Freedom, Fervency and Zeal, p. 282; Freeman, 282; Freemasonry, p. 283; Free Will and Accord, p. 284. Democratic rule implies the just collective government of themselves by free men. Just as Freemasonry has its peculiar strength in the free choice of its members to become initiates of their own accord and that they have the qualifications to do so r being themselves free born and free men, so is the democracy formed of those united to govern themselves with due regard the personal liberty and equality of each. Only by knowledge of what is meant by Masonic freedom, liberty, and equality, may one best understand that democracy intended by the Freemason fathers of the Republic in the making of its Constitution. Scales, p. 666; Equality, p. 247. Both refer to the lesson of balance, and both ought to be considered in connection with the Level, p. 242. A just Masonic appreciation of these leads not to the anarchy recognizing no distinction, but to that brotherhood which rejoices unselfishly in our successful neighbour's referment. Belgium, p.102; Egyptian Mysteries, p. 232; Egyptian Priests, Initiation of the, p. 234; Grand Lodge (as a governing body), p. 306; Mexico, p. 482; Pike, Albert, p. 563; Scottish Rite, p. 671; Social Character of Freemasonry, p. 696. Oh time! immortal is thy life! Yet all too soon, thou Scythe of Time! When you joined our circle it was not by means of purchasing a subscription to THE BUILDER but by taking out membership in The National Masonic Research Society, and therefore you are entitled to much more than the twelve monthly numbers of the journal each year. The Society carries on a constantly increasing service by correspondence. This service covers the whole field of Masonic research, study, and reading, and of all the various activities that pertain to those interests. If you have any need at all for the Society's services do not hesitate to write to us about it. Do you have a talk to prepare and can't find any materials for it? Or, it may be, do not know how to go about preparing a talk on Masonry? Let us help you. Do you wish to borrow or to buy a book on Masonry? Ask us. We are not always able to obtain books, either for loaning or for sale, but we do our best. We have a few books for sale ourselves. If a book can be purchased, and we do not have it on our lists, we shall tell you where you can get it. If you wish to borrow a book we shall help you find the loan of it when that is possible. If you are thinking of buying some books but wish first to consult us about their value, feel free to write about them. If you wish to start a Study Club in your lodge but do not know how to go about it we shall be very glad to help you. After assisting in the organization of several thousand we have learned much from experience, and this which we have learned we are here to share with you. If you are of a mind to undertake the study of Masonry privately and for your own individual benefit we shall be equally pleased to lend you whatever assistance you need toward outlining a list of titles, and in securing whatever materials you may find necessary. You are entitled to all these forms of service by virtue of your membership in the Society, and you must consider yourself at liberty to write to the Society at any time about anything. There will never be any charges whatsoever for such assistance as it is the Society's function to render. THE BUILDER is not a magazine in the strict sense of that term but a Journal, by the which is meant that its control and management is vested in the Society as a whole instead of in the hands of one man, or a group of men, and it exists to reflect the life of the Society and to minister to the needs of the Society. Each and every one of you is associated with the editor in the production of it. If you have something you consider worth publishing submit it; if there is room for it, and it is deemed worthy of print, it will be published. Every member has the right to contribute materials to THE BUILDER. If you are troubled by some difficulty in your reading about Masonry send your problem to the Question Box Editor. You will receive a reply as soon as it is possible to unearth the facts, and unless the Question Box Department is overcrowded the reply will appear there in due time over your initials. As soon as a reply is prepared you will receive a copy of it through the mails. If you have anything to say about the Society itself, or about THE BUILDER, or if you wish to address a word to the Fraternity at large, or make some comment on matters of the day that pertain to Masonry, prepare a letter for the Correspondence Department. Many letters are received and replied to that do not appear in that department, but all letters that deserve a wide notice or are worthy of permanent record, are published sooner or later, if it is possible to find the space. If you are the director of a Study Club and you are looking for an outline of studies for your club turn to the back numbers of THE BUILDER beginning with 1917. You will there find the beginnings of a complete course of such studies covering the entire Blue Lodge ritual. At the present time a second series is running on "The Teachings of Masonry." In order to meet the demand for the first series it is arranged to publish the same in book form some time during this year. This volume will be arranged as a text book for Study Clubs and will contain all the information and helps that any club will need under ordinary circumstances. If you have become interested in Masonic reading and study you should possess the bound volumes of THE BUILDER. Thus far seven such volumes have been issued. Each volume contains an index and there is a consolidated index covering all the volumes together for the first five years. These seven bound volumes comprise the largest and most accurate as semblage of articles and of information dealing with Masonry that can anywhere be obtained. THE BUILDER has already become an encyclopedia. If you have not already done so it will be worth your while to read very carefully the paragraphs on the inside front cover of THE BUILDER. And now a word about Masonic books. Many of our best works are published abroad, and it is often quite impossible to get them. Other works often quoted have gone out of print and therefore cannot be included in our book list. In that event we are always ready to refer a request for these titles to houses that deal in second-hand Masonic books. The titles included in our own list are not by any means the only ones that we should recommend; they are listed because it is possible to supply them promptly in quantities. If you encounter a book that we have not reviewed in The Library Department acquaint the editor with the fact. He is evermore on the lookout for all Masonic books that appear. If you know of a book that you believe we should include in our list write us about it. The National Masonic Research Society, including its journal, THE BUILDER, is not a commercial institution existing in order to pay dividends, but a Masonic service organization existing to render whatever help it can toward the enlarging and enriching of the life of the Masonic Fraternity, to the glory of which it is dedicated. If there are yet other questions that you have in your minds write to the editor about them. You are one of the family and you are urged to enjoy the freedom of the house. 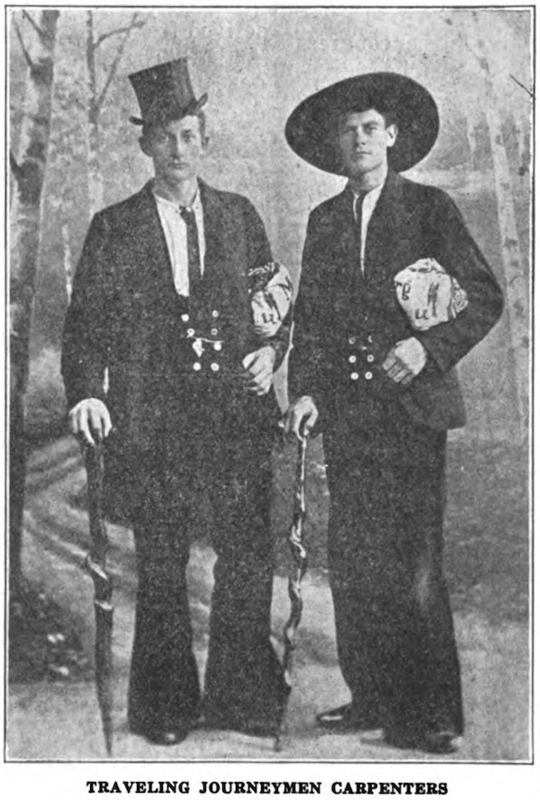 Ever and anon one encounters in Masonic journals and in Masonic speeches a good deal of fault-finding with Masonic study and research on the ground that a "real" Mason, a "true" Mason, — the words are emphasized here to conform with the emphasis that is always given to them in such cases — is one who works hard in charity, in carrying the burdens of the lodge, and in putting into practice in the world outside the principles that he has been taught inside the lodge, mstead of being one who wastes his time reading a lot of Masonic books. Why make any such distinction? If that distinction is valid in Freemasonry is it not equally valid elsewhere, and for the same reason? Then why send a boy to school to be taught mathematics, logic, history, poetry whereas he might be putting in his time at the more practical tasks of driving a delivery wagon or following the plow? Why should a man ever waste his time reading a book when it is well known that a book is a string of mere words, and there is so much actual work to be done in the world? These will be considered ridiculous questions but they are not one whit more ridiculous than the attempt to draw a line of cleavage between Masonic study and Masonic practice, because a man needs use only one eye while he is abroad in the Craft to see that as a rule the men who do the most Masonic reading are the ones who do the most Masonic work. A statesman reads history in order that he may the better meet the problems of his own day. A professional man studies Latin in order that he may the better understand how to write a prescription or design a building. A physician studies anatomy, with all its thousand and one details of remote significance, in order that he may the more successfully diagnose the malady of a sick child. There is no conflict anywhere between right study and right practice, and there never has been. Men study to know in order the better to do. So has it always been, so is it now, so will it ever be. And so is it in Freemasonry. Those who study to know the history, the philosophy, the ritual, the symbolism, the jurisprudence, and the literature of the Craft are not idle dilettanti anxious to set up false claims to mentality, but men who are busy equipping the brain that it may all the more successfully direct the hand. "Poor deluded man, he had paid $715 to get all there was in Masonry he remembered that, but not a word of the ritual, not a beauty, not a lesson. For his $715 he had gotten nothing. Money will not purchase the beauties of our mysteries. They must come through the heart and mind and not through the purse. Before you can see all the gems and beauties of our beloved Order revealed in their grandeur, you must have a vision." "The Story of the Craft," by Wor. Bro. Lionel Vibert, author of "Freemasonry Before the Existence of Grand Lodges," etc. Published by Spencer & Co., 19 Great Queen Street, London, W.C.2. For sale by the National Masonic Research Society at $1.35, postpaid. BY A HAPPY circumstance this book has appeared almost coincidentally with the installation of Brother Vibert in the East of of the Lodge Quatuor Coronati, Masonry's highest academic honor. Not since the days of the giants has any other man been more justly entitled to the position, for Brother Vibert has been these many years a faithful and diligent servant of that great research institution, and it would be impossible to discover another more thoroughly imbued with its tone, or more attuned to its methods. His earlier work, entitled "Freemasonry Before the Existence of Grand Lodges" and very well known, was a compend of the more important results of Quatuor Coronati researches in the field of early Freemasonry, and helped much to make available to laymen throughout the world the achievements of the scholars in that field. His new work, just off the press, is another essay in the same line, and quite as successful, which is praise enough. Of the Masons who feel an interest in Masonic history, and who desire to be intelligent in their Masonry as well as faithful, very few have either time or inclination to push their way through the great tomes of erudition in which lie buried whatever is known about the Craft: and these men, countless numbers of them, have been asking for something brief and simple that they may find time and ability to read. Also, there are many others, more advanced students, who, though they find opportunity to read a little, are utterly unable to keep pace with the latest developments in research, and are accordingly eager to have the field reviewed for them by some competent specialist. Brother Vibert's book, "The Story of the Craft," is designed to meet the needs of both these groups: it is brief (88 pages in all) and simple, and it is an authentic report (though not in the form of a report) of the results of Quatuor Coronati researches in the department of general Masonic history. "There now appeared in London a number of Irish Freemasons, men of very humble social standing for the most part, but Masons nevertheless, and following the usages that in their minds were associated with the Craft from time immemorial. Not only did they find the Grand Lodge (this refers to the "Modern" Grand Lodge. — H.L.H.) following different practices, but these Irish Masons were refused recognition by that body. "They thereupon, in 1751, took the strong step of forming a Grand Committee of their own, which in 1753 they made into a Grand Lodge, and they called themselves the Antients, to indicate that they stood for the true tradition, and the original Grand Lodge they described as the Moderns, in reference to the innovations it had introduced. Further, at this time the Grand Lodge at York, which had long since asserted, apparently without objection, that it alone was of great antiquity, was dormant. The Antients, therefore, also described themselves as 'York Masons,' meaning thereby no more than that they, like the Masons at York, preserved the true traditions of the operative lodges and the Old Charges, which refer to an Assembly held at York by Edwin. The moving spirit in all this was Laurence Dermott, who was Secretary, and later on Deputy Grand Master, and in 1756 he issued Constitutions, under the title of 'Ahiman Rezon' (which has been explained as meaning 'faithful brother Secretary'). They also very soon had a peer as their Grand Master, and the circumstance that at a later date two Dukes of Atholl presided over them, the second being their last Grand Master before the year of the Union, (the Union of the Antients and Moderns came in 1813. — H.L.H.) also led them to be known as the Atholl Grand Lodge. No doubt they attracted to themselves many who were dissatisfied with the original Grand Lodge and its methods, but it must be clearly understood that in its inception the Grand Lodge of the Antients was not a seceding but an independent body." In this excellently brief fashion Brother Vibert covers about the same ground as Gould's "Concise History" except — and this is somewhat a new departure in writing Masonic history — he ignores in beginning the long story of the ancient backgrounds of Freemasonry, in which usually are included accounts of the Ancient Mysteries, the Collegia, the Comacini, and all that. If any advance serious objections to Brother Vibert's volume it will be on the ground that he has too completely ignored the part played by organizations other than Operative Masons in the evolution of the Craft. As things now stand, so it will be urged, the features of Freemasonry that most appeal to the imagination are in many cases manifestly not of operative origin at all, but derive from occult fraternities and similar groups; and these elements have as necessary a place in even a brief resume of Masonic history as any account of builders' lodges and their work. To this Brother Vibert would very probably reply that he has undertaken only to tell the story of the institution as an institution, without reference to the ritual and philosophy and antiquities, and that everything cannot be told in only eighty-eight pages. The student, especially the beginner, who needs at hand a brief reference work in which to find dates, names, and facts, will have no cause to quarrel with "The Story of the Craft" on the ground of omissions, for it contains nearly all the more salient matters of fact. For my own part, I shall place the volume on the shelf with Gould's "Concise," and stand ready to recommend it to beginners in Masonic study and to Study Clubs whenever an opportunity presents. Among more recent publications Heiron's "Ancient Freemasonry and the Old Dundee Lodge, No. 18," "A Century of Masonic Working" by F. W. Golby, and "A New Encyclopedia of Freemasonry" by A. E. Waite (all published by the same firm) should go along with it on the same shelf. And if anybody chances to ask me, "Do you like Vibert's new book? ", I shall reply that I like it very well except that it does not have an index. Alas for all these English brethren who have formed the bad habit of publishing books without index! "Masonry in the World War, a History of the Masonic Club of A.P.O. 726, A.E.F., Blois, France." Compiled by Brothers E. Q. Jackson, J. M. Loughborough, and Mitchell Wilt. Price fifty cents. Among the many Masonic clubs organized in France by members of the A.E.F. the club at Blois was one of the most successful. Among the larger units of organization which constituted the A.E.F. and which helped mightily to put the Boches to sleep was the Service of Supplies, or, as it was familiarly known, the S.O.S. Under this service there existed at Blois a Casual Officers' Depot, American Post Office 726. The function of the C.O.D. was to reclassify wounded officers who were ready to return to service, also, green officers, just over who had not yet been assigned, were sent through the C.O.D. in order to be fitted into their places. To maintain a big institution such as the C.O.D. required many resident officers, commissioned and noncommissioned, and these were called "permanents." Among these "permanents" were, of course, a lot of Masons, and thereby hangs this tale. On the 15th of March, 1918, a number of these brethren held an informal meeting with a view to the organization of a Masonic Club. On March 22nd another meeting was held, and on March 29th a permanent organization was effected under the name "High Twelve Club." On May 3rd this name was changed to the "Masonic Club of A.P.O. 726." But there is not space in which to carry the interesting story any farther. To that end the three brethren listed under the caption have compiled and written a paper-bound history of this club, and a good one it is, full of romance and information, and done in the very best style. In connection with the history of the club these brethren have furnished a list of brief biographical sketches of the brethren who worked in it and, what is still more important, a roster of the club arranged alphabetically according to states. Of these names there are more than nine pages, and every state seems to be represented. Those who in any way came into contact with the club at Blois will surely wish to have this book; so also will the Masonic reader who desires to keep in touch with the developing story of Freemasonry overseas. A copy may be obtained by writing to Brother E. Q. Jackson, 846 Lexington Avenue, New York. N.Y.
"The Saint" by Antonio Fogazzaro. Translated from the Italian by M. Prichard-Agnetti, with an Introduction by William Roscoe Thayer. Published by Grosset & Dunlap, 1140 Broadway, New York, N.Y., by special arrangements with G. P. Putnam's, New York and London. Jeanne was the "woman" who had belonged to Benedetto's past. Donna Rosetta was the wife of an "excellency," the Under-Secretary of State, and a hard-lipped cynical person, loving intrigues. The latter had dragged Jeanne off to see the notorious "non-concessionist," Cardinal Blank, on the pretext that he might be wheedled into using his influence in behalf of "the saint," Benedetto, who had been commanded to leave Rome within three days. When the Donna Rosetta returned to the carriage to her awaiting friend she, — but I shall let the author himself describe the scene. "As she enters the carriage she casts a little book at her feet, and, instead of speaking, rubs her lips vehemently against her perfumed handkerchief. Finally she says, with a shudder, that she was obliged to kiss the Cardinal's hand, and that it was anything but clean.... And he had given her a little book on the doctrines of hell and the inevitable damnation of Freemasons. It was this little book she had cast at her feet on entering the carriage." Donna Rosetta and Jeanne rode home with the little book about the inevitable damnation of Freemasons under their feet. This sarcastic little gleam lies upon the book like a blue ray from the moon through an angry sky. Is the sarcasm intended for us, for us Freemasons? or is the author making sport of the Cardinal whose hand "was anything but clean"? It is hard to say. Oh! well, the little incident is indeed a little incident, and it has been described here because it is a point of contact between a famous novel and our Fraternity. Antonio Fogazzaro was born at Vincenza in 1842, a district then under the immediate control of Austria. Having been bred to a liberal mind he was obliged to seek the Dee air of Piedmont, where Cavour labored titanically and (at last) successfully to steer the Italian people between the Scylla of the Red Revolutionaries headed by Mazzini, and the Charybdis of the Black Reactionaries, headed by the lean-handed gentry of the Vatican, to a constitutional free government. Law was Fogazzaro's vocation — he became a senator at last — but literature became his mistress, and it has been in her field that he has won himself his laurels, quite the greenest and brightest that any Italian novelist has worn since the days of the great Manzoni. In 1881 he published his first romance, "Malombra"; and in 1905 crowned his carreer with "Il Santo," the volume now on the table. A few years ago a middle western preacher attracted some attention with a book on "If Christ Came to Chicago." It was a literary scheme for casting the Chicago morals into contrast against an ideal background, and it succeeded very well. "The Saint" is such another book, albeit on a much higher plane of literary excellence. "If a Saint came to Rome, to the Rome of the Vatican and the Quirinal," — that is the theme of "The Saint." Benedetto is a saint, so the author assures us. He is given the dress, the mien, and the vocabulary, and every other character in the book announces him as such. But alas! his actions and his speeches, some of the latter of which are quite long sermons, and even his death, do not give us readers that impression, unless it be that we shall be content with hearsay. Fogazzaro does not belong among the great literary creators. He was not able to let Benedetto himself, by word and by deed, reveal himself to us as a Saint; he was compelled to have us believe it on the author's word. In consequence of this lack of final creative power, the reader, for all his genuine interest in the exciting book, discovers it at bottom to be a sublimated melodrama. It is a moving picture panorama drifting across the vision wherein popes, monks, innkeepers, college students, gardeners, musicians, atheists, freethinkers, politicians, and a few lovely women move along from one interesting situation to another. After this panorama has passed it is forgotten; the characters have not remained behind in one's mind. Having said that "The Saint" does not belong among the greatest (where many of its admirers have placed it) it remains only to say that it is well within the next-to-the-greatest. It deals with a high theme; it compels one's interest; it has valorousness and vision. One is glad to have had the privilege of reading it. Senator Fogazzaro wrote the book as an ardent Roman Catholic of the more liberal school, who expressed himself as not afraid of the new mood of inquiry and examination which we call the scientific spirit, and who called upon the governors of the church to open the doors to this new spirit in order to prove to this generation the eternal vitality of Roman Catholic dogma. Alas and alas! the book has been placed on the Index! "The Book of the American's Creed." The conditions under which this volume is circulated are described below. Issued by the American Creed Fellowship. "In 1916, Henry Sterling Chapin, of New York, conceived the idea of promoting a country-wide contest for the writing of a National Creed, which should be the briefest possible expression of American political faith, and at the same time embrace the fundamental things most distinctive in American history and tradition. "Early in 1917, the proposed contest was announced at a large gathering of representative American authors, artists, and editors. The American Press took up the challenge and a number of the great magazines published editorial articles wishing the plan success. "On behalf of the city of Baltimore, Mayor John H. Preston offered an award of $1,000 for the winning creed." Committees were appointed, conditions were published, and the contest was on. The choice of the Committee on Award was announced to be the Creed submitted by William Tyler Page, who lives in a suburb of Washington, D. C., and who, by his researches in constitutional government, and by a fervent and devout study of American history, had saturated himself with the spirit of Americanism. Such, in quotation or in substance, is the account of the origin of the now familiar "American's Creed" as given in the latter part of "The Book of the American's Creed," the great little volume now under review. The nation immediately accepted the Creed, and all over the land school children by the million were reciting its stately simple sentences. Many patriots who saw what the result of this might mean to the nation conceived of the idea of perfecting an organization that might serve as a means of placing the Creed into the hands of every school child in the land. Out of this idea grew the "American's Creed Fellowship," the nature and function of which are so well described in the pages of "Educational Foundations," a pedagogic bi-monthly published at Cooperstown, New York, the old home of James Fenimore Cooper. "I desire to become a life member of The American's Creed Fellowship, and I herewith subscribe $1.00, for which I shall receive a Founder's Copy of 'The American's Creed' issued under the auspices of the historical and patriotic societies of America, the same containing the Creed, the story of its origin, and the basis for its phrases in the sayings of the Founders and Builders of the Republic. "I endorse The American's Creed as a summary of American political faith and I will lend my moral support to the use of the Creed throughout the Nation." Return slip and dues to The American's Creed Fellowship, 849 Park Ave., Baltimore, Maryland. * PIease state membership, if any, in patriotic society or societies. The Committee on Announcement has issued a pamphlet stating one great specific object of the Fellowship. Under the heading of "The American's Creed Fellowship" it states that "A call to the colors means a defense of American constitutional government 'against all enemies, foreign or domestic.' Armies led by foreign foes must be repelled by force; but those misled by domestic enemies may best be won by education. "The American's Creed, as a comprehensive summary of our political faith, offers the simplest basis for explaining the principles of constitutional government. "Let us not only continue the teaching of The American's Creed in our schools, in peace as well as in war, but extend the use of it in citizenship work. "To forward this purpose, The American's Creed Fellowship has been organized. The Fellowship hopes to place 'The Book of the American's Creed' in the hands of the graduates of the grammar schools of the United States. "Each child is to be awarded the book on the sole condition that he or she can recite the Creed. Three objects will thereby be accomplished which have not yet been successfully combined in any patriotic endeavor. "(1) It will interest the child; (2) It will carry an effective message to the home; and (3) There will be almost no wastage of money or material. "The Fellowship offers a specially numbered Founder's Copy of 'The Book of The American's Creed' to every signer of a Fellowship card." The Committee on Publication consists of the following: Matthew Page Andrews, Porter Emerson Browner Henry Sterling Chapin, W. B. Chapman, Irvin S. Cobb, Hamlin Garland, Ellen Glasglow, Richard Gwinn, James H. Preston, Julian Street, and Charles Hanson Towne. Headquarters for correspondence and information are at 849 Park Avenue, Baltimore, Maryland. Washington Headquarters are at the Offices of the Clerk of the House of Representatives. The book itself is a little jewel of pure English, of clear thinking, and of the bookmaker's art, sixty-six pages in length, and appropriately bound in blue. After printing The American's Creed it devotes 52 pages to an exposition of its every phrase; this is followed by an account of the manner in which the Creed came into existence; and the volume closes with a list "Of the Doctrinal Authorities Upon Which the American's Creed is Based." Every citizen in the United States should possess a copy of this book. Every pastor, school teacher, politician, publicist, and public speaker should read, mark, and inwardly digest it, for the like of it cannot elsewhere be found. And as for Masons, every member of the Fraternity from one coast to the other, should keep it ever at his hand. It is one of the clearest and most concise statements of the principles of the American government that has ever been written. We are constantly receiving inquiries from members of the Society and others as to where they might obtain books on Masonry and kindred subjects, other than those listed each month on the inside back cover of TIIE BUILDER. Most of the publications wanted have been out of print for years. Believing that many such books might be in the hands of other members of the Society willing to dispose of them we are setting apart this column each month for the use of our members. Communications from those having old Masonic publications will also be welcomed. It is requested that all brethern whose wants may be filled through this medium communicate with the Secretary so that the notices may then be discontinued. By Bro. Ernest E. Ford, 306 South Wilson Avenue, Alhambra, California; Ars Quatuor Coronatorum, volumes 3, 6 and 7, with St. John's Cards, also St. John's Cards for volumes 4 and 5; "Masonic Review," early volumes; "Voice of Masonry," early volumes; Transactions Supreme Council Southern Jurisdiction for the years 1882 and 1886; Original Proceedings of The General Grand Encampment Knights Templar for the years 1826 and 1835. By Brother N. W. J. Haydon, 664 Pape Ave., Toronto, Ont., Canada: A set of Gould's History, six volume edition preferred. By Bro. E. A. Marsh, 820 Broad Ave. N. W., Canton, Ohio: "The Traditions of Freemasonry," by A. T. C. Pierson, published at St. Paul, Minn., 1866. By Bro. Silas H. Shepherd, Hartland, Wisconsin: "Catalogue of the Masonic Library of Samuel Lawrence," "Second Edition of Preston's Illustrations of Masonry." By Bro. H. H. Klussmann, 310 Monastery St., West Hoboken, N. J.: "Traditions of Freemasonry," by A.T.C. Pierson; "Illustrations of Masonry," by Preston. By Bro. Silas H. Shepherd, Hartland, Wisconsin: "Stray Leaves from a Freemason's Note Book," by George Oliver. This volume also contains "Some Account of the Schism showing the presumed origin of the Royal Arch Degree." Univ. Mas. Lib. edition. Price $3.00. "Lights and Shadows of Freemasonry," by Robert Morris. (Fiction and anecdotes.) Price $3.50. Some time ago I read a statement to the effect that prior to the seventeenth century there was no existence in our traditions or other literary matter of any claim for descent or other connection with the Temple of Solomon — that the appearance of this claim dates from the arrival of a learned Jew in England who appeared before the court of King Charles I with a model of the Temple and impressed his views as well on those who formed the Accepted part of the Order so that their influence caused his story to be incorporated into our legends. What evidence is there for this? There is no evidence. The story is absurd and obviously is founded on the exhibition of the model of the Temple of Solomon designed by Gerhard Schott, rathsherr of Hamburg, and finished by him in 1694. On his death, his heirs found difficulty in selling the model at what they regarded as a just sum, but finally disposed of it to an Englishman. The date of 1717 for this transaction is given by Schott's biographer. It was exhibited in London for years and ultimately found its way back to Germany. In 1890 it was in Dresden. (See Dr. Hagedorn's letter, Ars Quatuor Coronatorum, vol. xiii, 1900.) As to a "learned Jew" appearing with such a story, he would have encountered even at the merry court of Charles I, Hebraists whose learning was quite equal to that of any student of the Hebrew language, whether born to the tongue or not. It was English bishops who gave us King James' version of the Bible, and the Universities certainly would not forget Hebrew because King James did not live forever. If you will refer to THE BUILDER for September, 1920, page 3, you will find a summary of views on the legend of Hiram and its introduction into Freemasonry, written by Brother H. L. Haywood, that very fully covers the question, and you will be inclined to adopt Brother Haywood's conclusions. To this it might be added that the late Sir Walter Besant believed the legend to have come to us from the Alchemists, Rosicrucians and perhaps Gnostics, while, on the contrary, W. H. Rylands, the great Masonic authority of England, believed it was derived from the miracle plays of the Middle Ages. The researches of E. Conder, Jr., as published in the Ars Quatuor Coronatorum, went far later to convince Brother Rylands that it could not have originated in miracle plays, English, at any rate, but the field is still open to the investigator. What are the Cardinal Virtues? Are they supposed to be based on the New Testament; if so, on what text or texts? The Cardinal Virtues were enjoined by the Greek and Roman sages long before the advent of Christ; therefore, though they are met with in one form or another in every part of the New Testament, they do not rest, for their sanction, upon any one or more of its texts. See the thoughtful comments on these Virtues, which are Temperance, Fortitude, Prudence, and Justice, in Brother Oliver Day Street's article, THE BUILDER, August 1918, page 242. Cicero gives a characteristically Roman account of them in his De Inventione Rhetorica, Lib., II, cap. 63, 64; if you will consult that reference you will discover that these Virtues do not mean the same thing to us that they did to the Romans. The word "cardinal," in this connection, means "principal," or "pre-eminent," and oftentimes is applied to more than the conventional four, as, (the case is noted in Mackey's Encyclopedia) in the dome of Ascension of St. Mark's at Venice fifteen are given. It was Plato (see his Republic IV, 427) who first gave currency (or so it is supposed) to the four Virtues with the list of which we are so familiar, and it is said that St. Ambrose was the first Christian theologian to adapt the list to the Christian system of morals, though it was with misgivings and with a full understanding of the limited and arbitrary character of Plato's list. Roman Catholic theologians formed the habit of describing these Cardinal Virtues as "natural" in contradistinction to Faith, Hope, and Charity which they, for obvious reasons, described as "theological." Henry Sidgwick, in his "History of Ethics," goes thoroughly into all this (pp. 44, 133, etc., 6th edition). St. Augustine loved to work over all the old "pagan" ethical doctrines, especially the Cardinal Virtues, into the phraseology of Christianity and in this he has been followed by Christian theologians ever since. Thomas Aquinas, the master of all the Scholastics, preferred to follow the lead of Aristotle, the god of the Scholastics, in his interpretation of the Four, as will be found in the "Nicomachean Ethics," which is a volume you should consult if you are interested to pursue this subject very far. It is a curious fact that the melancholy and unfortunate Belgian sage, Arnold Geulinex, whose principal works were published posthumously, held that all virtues flow from the one supreme fount of the love of right reason; and that the cardinal virtues are diligence, obedience, justice and humility. It will be seen that there is no very fundamental importance in the arbitrary list that Plato gave us of the four Cardinal Virtues; other ethical thinkers have chosen other lisp, and so may we. One virtue so often leads to another that one could select almost any three, or any other number for that matter, and from those selected deduce a whole system of morals, and wholesome, perhaps, as well as whole. Nevertheless it remains true that when they are properly understood the orthodox four will furnish one with a pretty complete foundation structure for a good working moral system. In the Masonic system the Cardinal Virtues are referred to in the work of the First degree. In a Masonic speech which I heard last Sunday the speaker mentioned a certain Yates with so much feeling that I was led to believe that this man must have been a figure in Freemasonry at one time. But I have never before heard of him. Can you guess who he might have been? Your orator must have referred to Giles Fonda Yates — his name sounds like a line from some melancholy poem, does it not? — who was so zealous and influential an apostle of the A. & A. Scottish Rite in the early days of that Order. Brother Albert Mackey was a close friend of Yates and writes of him with feeling, as you will discover if you will turn to the brief sketch in the Encyclopaedia, Volume II, page 864. In addition to what you will find there it may be said that Yates was for some years editor of the department called "Horae Esotericae" in the famous old "Freemason's Quarterly," which journal, as Dr. J.F. Newton has put it, died of too much excellence. Also, Yates was a tireless student of Indian lore, more especially of the secret societies and rites of those people, and he was for a number of years a sub-chief in one of the sections of the Mohawk tribe. Yates was born in Schenectady, New York, in 1796; he died in New York City on December 13, 1869. For a brief time in the height of his Masonic career he was Sovereign Grand Commander. Will you please give me the name and address of the Grand Secretary or the head of the Acacia Fraternity? Grand President — Harry L. Brown, 1670 Old Colony Building, Chicago, Ill.
Grand Counsellor — Howard T. Hill, Box 1, Manhattan, Kansas. Grand Treasurer — Carroll S. Huntington, 1428 Lunt Ave., Chicago, III. Grand Secretary — W. Elmer Ekblaw, 711 W. Nevada St., Urbana, Ill.
Will you please advise me if Arthur Brisbane, editor of the Hearst newspapers, is a Mason? In reply to our personal inquiry Mr. Brisbane replied: "I wish to say that I am not a member of the Masons or of any other fraternal organization. I am plainly and simply a newspaper man." I was very much interested to read Brother Pomeroy's article that appeared in THE BUILDER for March, and note that he speaks of a large engineering magazine published by Masonic Engineers. Can you please give me the name and address of the same? Gladly. The journal referred to, one of the best in the world, is "The Universal Engineer," which is described as the "Official Publication of the Universal Council of Engineers of the World." It is edited at 160 Nassau Street, New York City, and printed at Cooperstown, New York. The office of the Corporation is 784 Broad Street, Newark, N.J. I find it hard to discover good books on the life of Confucius, and would like to ask if you could furnish me with the title of a good one. The best, perhaps, is "The Life and Teachings of Confucius" by James Legge, the great sinologist. It is volume I of the series called "The Chinese Classics: Translated into English, with Preliminary Essays and Explanatory Notes." The volume was published by Began Paul, Trench, Trubner & Co., Ltd., Dryden House, Gerard Street W., London, England, 1909. I have had it in mind to ask you for some time if Hosea Ballou, the founder of the Universalist Church, was a Freemason. I am a member of that denomination and find its teachings very much in harmony with those of the Order. Will thank you for this information. Brother Hosea Ballou was admitted to Mount Lebanon Lodge, Boston, Massachusetts, on October 27th, 1817; was appointed its chaplain in the following December, and remained a loyal and consistent member of the Order until his death in 1862. Are you quite accurate in describing him as the founder of the Universalist Denomination? Universalists themselves accord that honor to the English immigrant preacher, the Reverend John Murray, do they not? Ballou was born in Richmond, New Hampshire, in 1771. After experimenting with churches in various centers he at last settled in Boston in charge of the Second Universalist Church, which office he held for thirty-five years, or until his death. He founded and edited two Universalist journals, and it is estimated that he wrote about 10,000 sermons. His best known work was his "A Treatise on Atonement," issued in 1806. He was a great and good man, as much an ornament to Freemasonry as to Christianity. Do you not think it possible that the world should utterly lose some things of great wisdom? Do you not believe that some of these things, once believed lost, are really preserved in Freemasonry? The world has lost many ideas, truths, and sound philosophies. The writer was only yesterday reading some remains of the old Greek, Isocrates, who lived in the fourth century, B. C., and who was telling what he believed a real education should be; among his other specifications was this, that an educated man "as seldom as possible misses the golden mean." What is meant by the "golden mean"? How many know? Very few, because the idea is almost lost out of the world, though at one time it was a living part of the fabric of Greek everyday thought, and satisfied the minds of some of the noblest thinkers that the world has ever known, or ever will know. And in the future we shall hear less and less of the golden mean until there may come a time that the most learned will be puzzled to know what it signifies. It is possible that some of the symbols in our ritual are, as it were, fossiliferous deposits of ideas equally true and equally fruitful which have been forgotten, so completely forgotten, that we do not even possess clues to their meaning. If you believe yourself to have recovered some such forgotten tfuths still enshrined in Freemasonry why not tell us about it? Is the First Assistant Postmaster General a member of the Masonic Fraternity? Hubert Work, First Assistant Postmaster General, is a member of Pueblo Lodge No. 17, A. F. & A. M., Pueblo, Colorado. The question came up in a meeting of the Study Club of which I am secretary as to how many popes have issued bulls against Freemasonry. Can you kindly let me have the answer soon in order that I may report at the next meeting? Here is the list with the date of the bulls, or first bulls. If there is an error in this list will the brother who detects it be sure to write to us? Pius IX, 1846. This pope attacked the Order in five different bulls. Leo XIII was the most tireless enemy the Order has yet encountered. He issued his first bull in 1882, then followed with others in the years 1884, 1890, 1894, and 1902. In countries where the pope maintained temporal power these bulls were effectual, and were often carried to the point of literal fulfillment, as witness the case of Spain, in which country many brethren underwent death, imprisonment, fines, and other sufferings for the sake of Freemasonry. Between 1780 and 1815 there were 19 cases in Spain; in 1816 there were 25 cases; in 1817 there were 14 cases; in 1818 there were 9; and in 1819 there were 7. Why is it that things we hear and read about the future life are often so vague? Can you tell me where I can find a book that deals with the teachings of the Bible on that subject in a definite and scientific manner? Why so vague? Because, in all probability, we know so little about the subject. The book you are after is "Eschatology; Hebrew, Jewish, and Christian," by R. H. Charles; published by Adam and Charles Black, London. The first edition was published in 1899. Dr. Charles is one of the most illustrious of all authorities on Eschatology, in which branch of theology the problems concerning the future life are usually classified. Dr. Charles has embodied some of the more important portions of his material in a smaller book called "Religious Development Between the Old and the New Testaments," published by Henry Holt and Company, New York, as volume No. 88 in The Home University Library of Modern Knowledge. Chapter V of this work, which deals with "Man's Forgiveness of His Neighbor — a Study in Religious Development" has become famous. It should be read by every Mason. Please inform me if you can what was the religious holding of James G. Blaine, and who made the speech about "rum, Romanism, and rebellion." "But a still more untoward incident was to mark this visit to New York. On the 29th of October a large number of clergymen assembled to meet Mr. Blaine and to assure him of their support. Their spokesman was the Rev. Mr. Burchard, who made a brief address which closed with these sentences: 'We are Republicans, and don't propose to leave our party and identify ourselves with a party whose antecedents have been rum, Romanism, and rebellion. We are loyal to our flag; we are loyal to you.' Mr. Blaine apparently did not notice the alliterative clause, but it would have been difficult to rebuke the attempt to introduce a sectarian issue into the canvass, if he had been aware of it, without giving offense. His political adversaries at once took advantage of the unfortunate remark to detach from his support all whom they could persuade that the election of Blaine would be a blow at the Roman Catholic Church. Some of the most unscrupulous of his opponents represented the words as those of Blaine himself. It is said that leaflets ascribing the sentiments to him were distributed at the doors of Roman Catholic churches on the following Sunday. There is no doubt that the heedless remark caused him the loss of more than enough votes to have changed the result in New York and thus to have elected him President." "Do you know whether any Chippewas are members of the Fraternity? There are quite a few Chippewas in the portion of Minnesota near the Red Lake Reservation who are educated." As to whether any of the Red Lake Chippewas, or more properly, Ojibway, belong to our own order of Free and Accepted Masons, I am unable to state, although this is not at all improbable. That is a question which the secretaries of the local lodges can best answer. As to the Indians being members of their own primitive Masonic order, yes indeed. Among the Ojibway the secret society known as the Midewin is highly developed, and possesses ceremonies, rituals, and rites of initiation and raising very similar to that described in my article "Little Wolf Joins the Mitawin," in the October, 1921, number of THE BUILDER; in fact, many students of ethnology believe that it is among the members of this tribe that the oldest form of the rites occurs. Unfortunately, although considerable time and money have been devoted to the study of this very organization among the Ojibway, the scientists who have hitherto done the work have not been Masons, and hence much of the most significant facts have escaped attention. The late Mr. W. J. Hoffman has written a monograph entitled "The Midewiwin or 'Grand Medicine Society' of the Ojibway," based largely on studies made among the Red Lake and Leech Lake Indians, and published in the Seventh Annual Report of the Bureau of American Ethnology of Washington, D.C. in 1885-6. He, however, entirely failed to grasp the significance of what he saw and heard, and, if I remember correctly, got no inkling of the true meaning of the underlying ritual, or the myth of the death and resurrection of the ancient founder of the lodge. I have myself spent some time among some of the bands of Ojibway in Manitoba, Ontario, and Seewatin, in Canada, and obtained some data on the subject, but, as I was not then a Mason — or rather was only an Entered ApprenticeCI too, was blind to the facts. Here is a fine opportunity for an original piece of work for someone who has had Light, and who possesses the patience, tact, and diplomacy to get really close to the Indian. The Ojibways are a very numerous people, as North American Indian tribes go, there being some 20,214 in the United States, and many more in Canada, according to the census of 1910. Of these, some are civilized according to our ways, others are still very primitive. The conservative old-style bands all possess the Midewin or Midewiwin, and the old leaders possess birch bark scrolls upon which are written in mnemonic characters, or picture writing, symbols referring to the songs and ritual of the lodge, the meaning of which is known only to them. It must be remembered that not all the members of any tribe are brethren, and the rites are often as unknown to the majority of any given group as they are to us, also the non-members are quite as given to speculation of an erroneous nature as to what goes on in the lodge as are white non-Masons. To obtain information, go to headquarters, and, as information and membership is commonly bought by the Indians themselves from the officers on joining, it can sometimes be bought by a white man who has the confidence of the Indians, and in whose sincerity they firmly believe. Other tribes having a form of this primitive society to my knowledge are: The Cree, Potawatomi, Menomini, Sauk, Santee Sioux, Winnebago, Iowa, Oto, and perhaps the Ottawa. Formerly the Miami, Peoria, and perhaps other tribes of the lllinois confederacy had it, and the Ponca and Omaha had an aberrant form. Practically nothing is known of the rites among the majority of these tribes except that all those of Siouan stock — i.e., the Santee, Iowa, Winnebago, Oto, Ponca and Omaha, are much farther from Masonry as we know it than the others. The Iroquoian tribes, that is the Seneca, Cayuga, Onondaga, Oneida, Mohawk, and the Wyandot, and perhaps others, have or have had, a different society which in some respects still more strongly resembles our Masonry. All readers of THE BUILDER who have in their possession important (as they would consider it) books on Freemasonry that have never been reviewed or noticed in THE BUILDER are requested to send to the editor titles, authors, publishers, and publishers' dates. Please. THE BUILDER would like to hear from Study Clubs that have devised courses of study for themselves. Also, it would like to have the names of the secretaries of active Study Clubs. One of the editors of THE BUILDER would like to get in touch with brethren who have made a thorough, or systematic study of architecture; of architecture, that is, without necessary reference to Freemasonry. Can anybody tell us where a complete set of the bound volumes of The American Freemason's Monthly Magazine may be obtained? It was begun, we believe, in 1886, and was cried on for quite a while by J. F. Brennan. Albert Mackey was editor for a time. I notice in the Question Box of the December number, in answer to brother L.I.F. 's question as to the number of Masonic college fraternities you state there are two, The Acacia, and Square and Compass. I knew of the Acacia but did not know of the Square and Compass — that is, as a fraternity. In many of the colleges and universities there are Masonic Clubs, usually designated as "Square and Compass Clubs." We have two here at the University of Southern California, one in the College of Law and one in the College of Liberal Arts. There is also a flourishing Masonic Club, but not called Square and Compass, at the University of Arizona, Tucson. The question of federating these different Clubs into some kind of general organization has been frequently discussed at the meetings of the local clubs here, and we have been hoping that some scheme would be put forward in the near future acceptable to all. What you say of the Square and Compass fraternity is true of these individual clubs, as far as I am acquainted with them, but so far as I knew they were still unfederated local clubs. Please advise me more fully on this point. There is now in process of organization at the University of Southern California the Phi Alpha Mu fraternity which will be a regular Greek letter fraternity but with membership open only to Masons and under the same restrictions as other Greek letter fraternities. It is hoped to make this the mother chapter and extend the fraternity to other colleges and universities. I also beg to call your attention to the Trowel Fraternity. There is a chapter in the Dental College of the University of Southern California here. The Bulletin of the Masonic Information Bureau of the University for the first semester has this item: "Trowel Fraternity, 4th year, consisting of 14 chapters — at present restricted to Dental Colleges and other professional allies. Local chapter consisting of about 45 members. Secretary and Treasurer — E.T. Dutkon, Dental College, 635 West Exposition Blvd., Los Angeles." I understand that the Trowel is not interfraternal, but do not know. THE BUILDER has been a source of great pleasure to me during the past year. The brethren who do not subscribe are certainly missing a lot. (Through an unfortunate misfiling of information ye editor cannot recover the information on which he based his statements concerning the Square and Compass fraternity. Will the brothers who sent him information get in touch with him again? Also, will any other brothers who have pertinent information about college Masonic fraternities send their data to THE BUILDER? Brother Bray has our hearty thanks for his letter. I send you a few words regarding A.E.F. Masonic Clubs. At Abainville, Meuse, about 3 kilos from Gondrecourt, there was a Masonic Club. Brother Hale was the Salvation Army Secretary at Abainville and was vitally interested in our Abainville Club. After our meetings we generally adjourned to his Hut for refreshments. We had good times. Abainville was the center of the American Light Railway Repair and Assembling Shops and the Abainville Club was made up mostly of railroad men. The Club adopted for a pocket piece a two franc silver coin with the reverse ground off and the Square and Compass engraved in the centre with the words "Abainville Club No. 1' around the coin. When I was at Abainville there was no club at Gondrecourt: the men from that town came to Abainville The President at that time was a Medical (Dental) Officer attached, I believe, to the 22nd Engineers (Lt. Ry.) named Ross, (I am not absolutely certain as to that name.) We initiated with paddles officers and men and we had great times. Wish I had a copy of the ritual; if you could get one, it would be worth while. Out of 26 men in the Third Batallion Headquarters two officers and four men were members of the Club. My Brother: Your zeal for the institution of Masonry and the progress you have made in its mysteries, have pointed you out as a proper object of our favor and esteem. From the time, ten years ago, when you knocked at the door of the preparation room seeking admission into our order, your ambitious feet have trodden round after round of the ladder which leads to fame in our mystic circle, and even the purple of the Fraternity has rested upon your honored shoulders. You have labored with us more than seven years, honestly toiling, and encouraged and buoyed up by the promise that if you were faithful, you should receive the reward due a Master Mason. Behold! your temple is nearly completed, and we hope you have received your reward in the satisfaction of having done something for others. You have learned that a life of service to your fellow men is the only life worth living. Night after night for the past seven years or more you have been present in this lodge room. Not for the honor alone (although such ambition is truly laudable) of having it said that you were Secretary, Junior Warden, Senior Warden, or even Master of Alpine Lodge, with but the one idea of service; that of teaching the brothers the principles of Freemasonry which for centuries have made better men, better citizens, better fathers, better husbands. Your work has been well and faithfully done, and may the G.A.O.T.U. accept and approve your labors. The brethren of Alpine Lodge wish to express to you, through me, their love and appreciation for the service you have rendered. This jewel is a token of their esteem, and the distinguished emblem of a Past Master, which they hope you will wear with equal pleasure to yourself and honor to the Fraternity. It is the largest Masonic organization on earth, is our Grand Lodge of Sorrow. It has an average membership of 42,300. It loses an average of 4,700 members by death every year. It recruits that many members every year so that the average membership remains about the same. Its members never meet in the Grand Lodge and there are no subordinate lodges. They never applied for admission and can demit only by death. They labor unceasingly to rebuild the temple of their bodies ravaged by the fever of disease. They walk in the valley of the shadow of death. They are the Master Masons who have laid down or must soon lay down their working tools and seek the aid and comfort of their brethren. They are the Masons of America who are victims of tuberculosis. Among the 2,600,000 members of the Craft, it is estimated that there are 42,300 suffering with this disease. Of this number 4,700 die annually. There are no Masonic Hospitals for their care and treatment. Their own lodges are, in most cases, financially unable to give them assistance over the year or more of time which would be required to arrest their disease under the most favorable conditions in a hospital or sanatorium. In many cases the lodge sends the patient to the Southwest for the benefit of the climate, with little money in excess of traveling expenses. Lodges in the Southwest are small in numbers and limited in funds. They cannot begin to care for the Master Masons asking for assistance. Free care and treatment can be secured only in hospitals in connection with poorhouses, and in some few Roman Catholic institutions. Who shall bear the burden of the care of the Mason without a lodge? Does the Masonic Fraternity of America owe him any duty? If so, how shall it proceed to administer relief? A committee, appointed by the Grand Lodge of Texas, to confer with similar committees to be appointed by the Grand Lodges of Arizona and New Mexico, three of the states affected by the migration of consumptive Masons, will attempt to fermulate a plan for the establishment of a hospital or sanatorium for the care of these brethren. The committee will welcome suggestions from any brethren, anywhere. Think on these things and give them the benefit of your study and experience. 2130 River Ave., San Antonio, Texas. Brother W. N. Grubb was made a Mason January 1,1879, in Ruth Lodge No. 64, Norfolk, Virginia, and one year afterwards was made secretary of his lodge. He has served in that capacity continuously ever since. He is still an active Mason and most effectual secretary after forty-two years and more. Doesn't that come near being a record? In this life you hold in trust! What a secret thou dost keep! Towering brothers of the deep! Of the northern winds will ring. When our sons to dust return. How 'twould start us with surprise! Would unroll before our eyes. Hides within thy narrow cells! A good word is an easy obligation; but not to speak ill, requires only our silence, which costs us nothing.